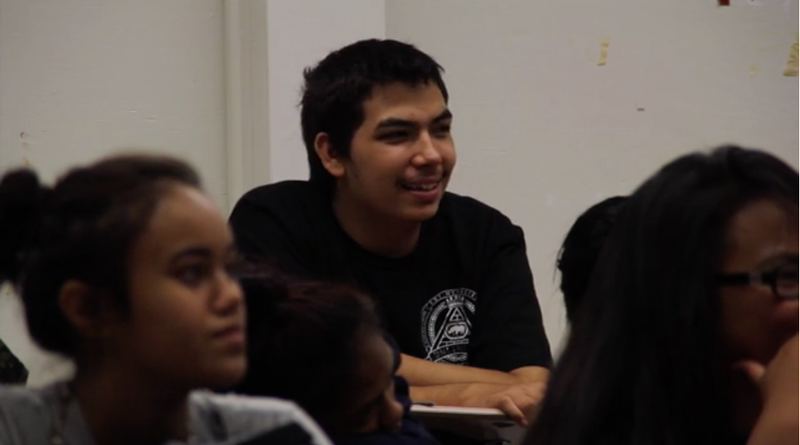 Each morning, 19 year old Adam Naki has something to do. 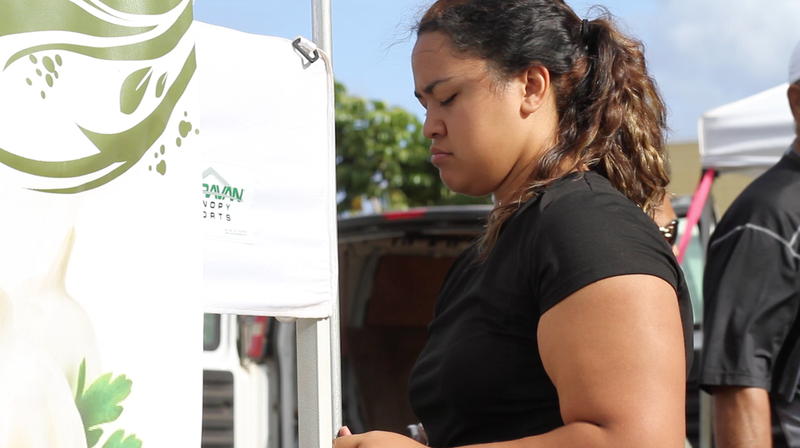 On weekdays, she has to haul her own water to the Waianae Boat Harbor to make sure she can wash dishes, have drinking water, and shower. 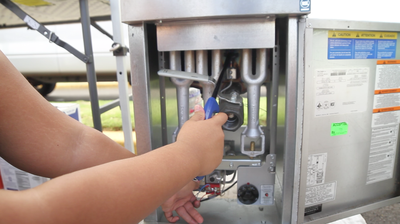 Another chore she has to do is make sure her generator is working in order to get electricity to charge her fan, and other electric appliances. The reason Adam has to deal with these small domestic labors, is because she is one of 3.5 million homeless in the world. 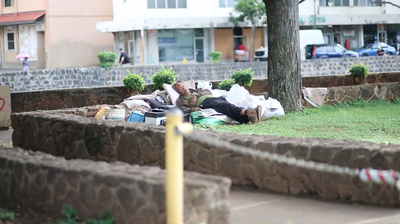 For the state of Hawai’i, at least 6,300 people are homeless on any given day. Though their reasons may vary; i.e. unemployment, high cost of living, one thing is certain- they do not have a permanent residence. 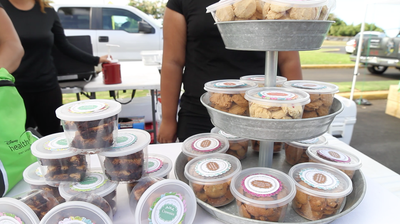 Adam herself has moved 12 times before finally settling at Hale ‘A’Ole in Waianae. Hale ‘A’ole translates to “without home” from the Hawaiian word ‘Hale’ which means home, and ‘‘A’ole’, which means “no”. Currently, the land that is being occupied by the Hale ‘A’ole members is owned by the Department of Land and Natural Resources. 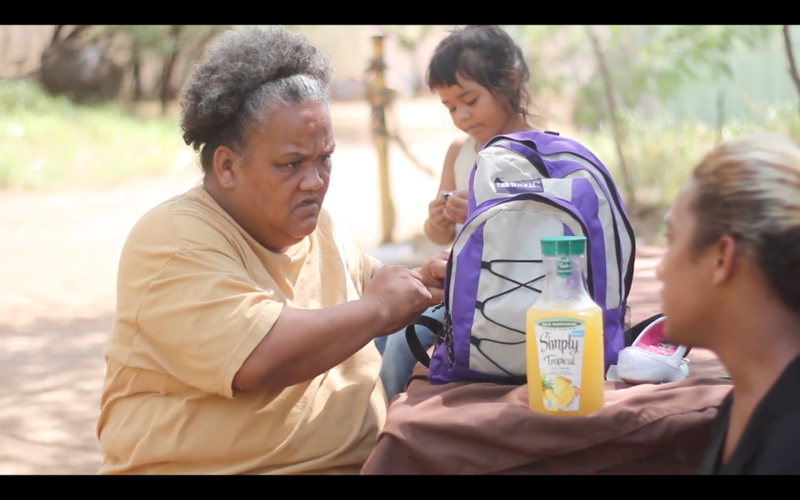 While being homeless wasn’t what they had planned, residents believe it’s a good place. “This community needs to be united to function well...living in this community...coming together...everybody has to get along,” said Adam Naki. 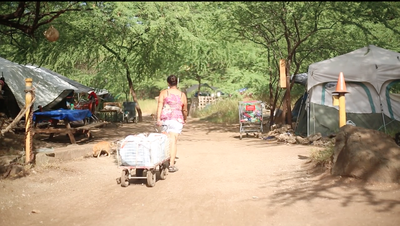 According to National Alliance to End Homelessness, Hawaii has the highest number of homeless people relative to their population. It’s an issue that has divided the state for a while now. “There’s not enough Section 8 vouchers, there’s not enough public housing units, there’s not enough low cost rentals out there. So people are just cycling back, either they’re back homeless, back in the shelter,” said District 21 State Senator Maile Shimabukuro. “One of the things we’re looking at really is trying to support people transitioning off the streets and beaches and directly into housing.” said State Homeless Coordinator Scott Morishige. For everyone at the state, these solutions are still a work in progress. 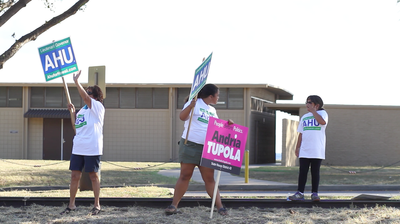 In the meantime, Hale ‘A’Ole is doing what they see fit. “To me, you gotta set morals out here. 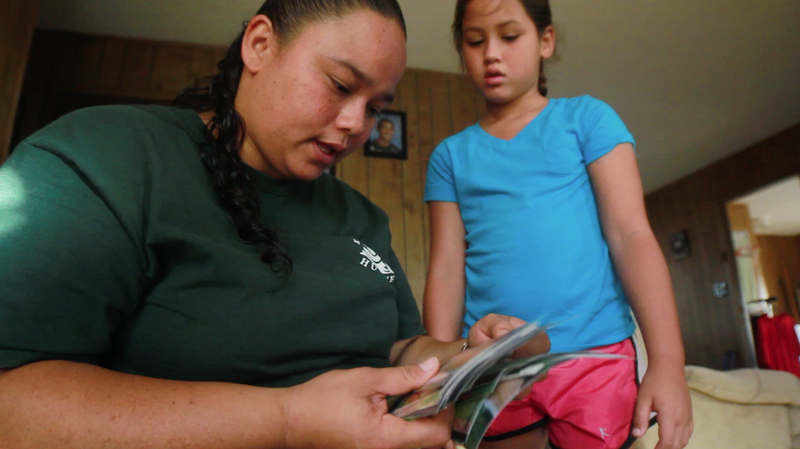 It’s no different than being in a house.” said Hale ‘A’ole community leader, Twinkle Borge. Until the nation can come to a consensus on addressing homelessness, Hale ‘A’Ole remains a safe haven for those with no place to go. For now, this is Adam’s place somewhere she can temporarily call home. “How you know if it’s home is if it’s your sanctuary, if you feel that you’re want to be there.” said Adam. David Manthei came from a small town of Winslow, Arizona. 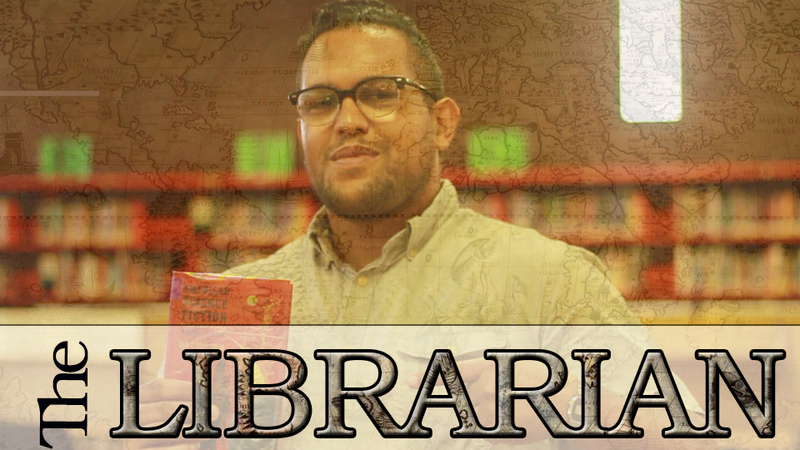 In that small town lies a library where his passion for literature developed. This passion led to his life as a librarian at Wai`anae High School. When asked about his outlook on being a librarian, Manthei said, "This job is amazing. 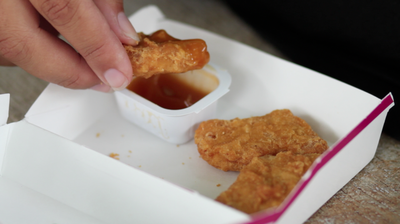 It's probably the best job on campus and I love having it." There was no excitement and he wanted to change that around. He began three years ago, transforming the library into a work of art. 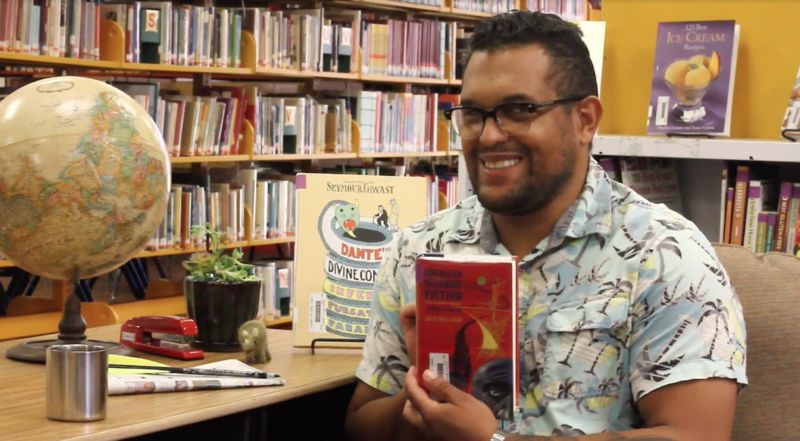 Manthei wanted students to come to the library not only to use it as a resource, but also to share the same passion for literature that he developed as a student. 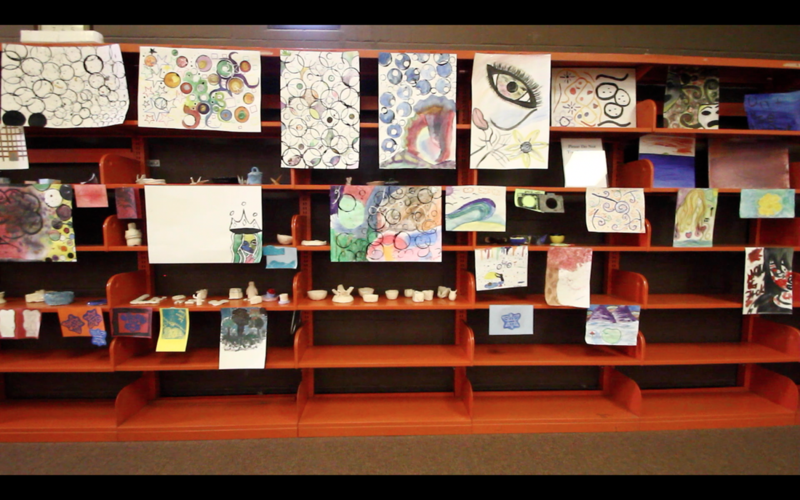 For three years he painted the walls, added pop-up colors and art pieces, placed student paintings, and stood outside inviting students into the library to view recently made movies that are based on books. In the early morning hours, he comes to work and sips his coffee ready to start the day. “This is the best job on campus,” he said. 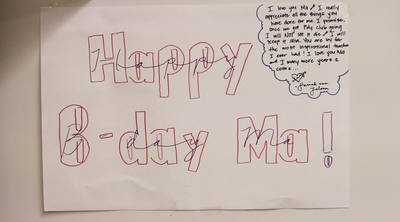 Although it seems like smooth sailing for Manthei, every story has its obstacles. For David Manthei, money is one and they count on voluntary work to make everything work. It is slow progress but it is still progress. Wai`anae High School’s health teacher, Beth Matsuda, reserves a piece of her heart for her students. In addition to teaching her kids the basics of the human body, she makes it a point to let them know that they have a shoulder to lean on. 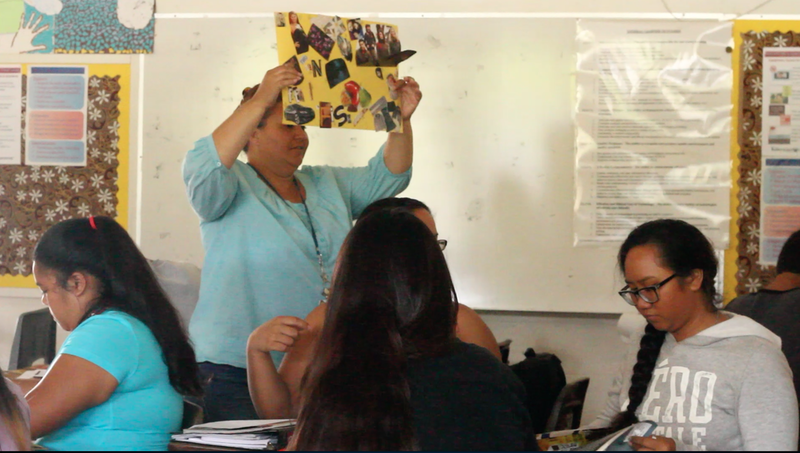 One of her prior students, senior Keoki Freitas expressed, “She is just there if I need her...always there to listen and give me advice on what I should do,” showing that the bond between her and her students are not temporary. In the eyes of Ms. Matsuda, having a strong connection with her students is vital to their learning in her class, “By building good relationships with them they trust me more and they are willing to accept help from me,” she admitted. The bond that Mr. Matsuda shares with her students is amplified by the knowledge that she will never be able to build something like that with kids of her own. 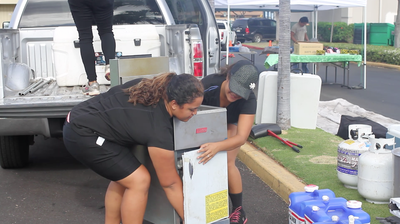 It's a tragedy that she has had to deal with for the past 20 years, but that does not stop her from spreading the love and generosity that she saved for her own kids unto Wai’anae High School’s students. The endless amount of support and comfort that the students have given Ms. Matsuda has allowed her to overcome the hardships that she faced. With an enthusiastic attitude, Beth Matsuda continues be a positive image to her student. 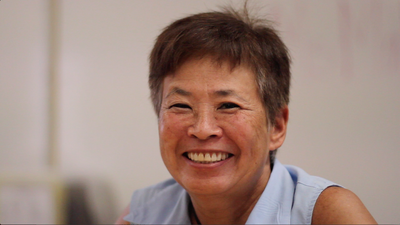 Leaving a piece of her heart with each of her kids, Beth Matsuda, more commonly known as ‘Mom’, changes their lives while they change hers. 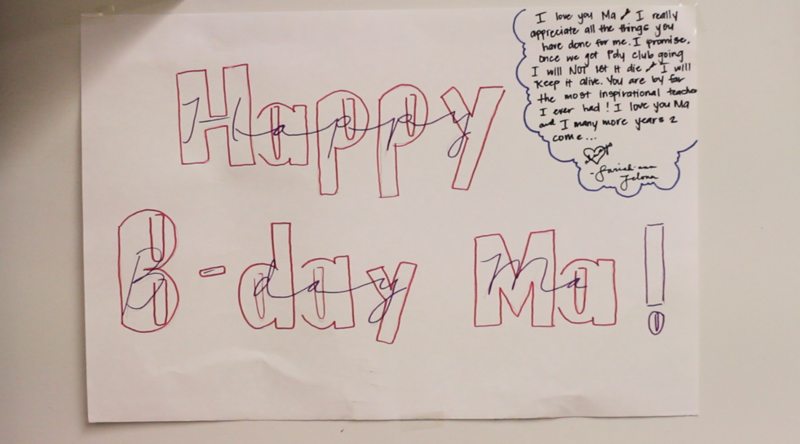 Not only did I learn CPR, but also the love Ms. Matsuda has for her students. When talking to Beth Matsuda, I learned that friends are important because when times get hard, they will be there for you. 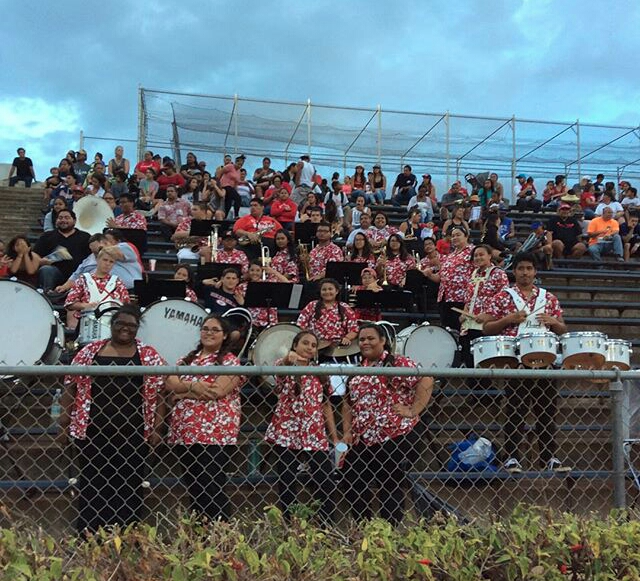 After many years of being without a band program, Wai`anae High School is back at its finest. Graduating from Hawai’i Pacific University and returning to her alumni high, Ms Shantelle Tom was ready to teach. 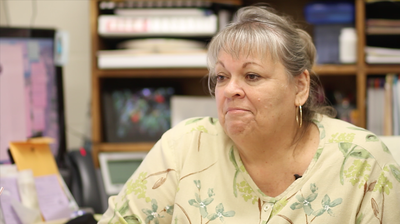 “My passion is helping students find what they love and going after it,” said Ms. Tom. Finding the right instruments and the money to keep the show on the road and keeping the band alive was proving that there is importance in music. Being able to teach students something new and see the outcome of it was one of the best things she is looking forward to. She puts her fullest effort into everything she does to motivate the future adults to always do their best and give it all they’ve got. “ I would definitely seem to find myself helping them academically but socially and with their family, friends and any problem they have” said Tom. She is more than glad to be someone you can talk to when you need a pair of listening ears. With her room open to anyone before school, lunch break and after school, there is always going to be a time when she would be listening. The point she will always be reminding her students that they should continue to follow in their dreams no matter what the struggle is or how much effort or time you will have to put into it. 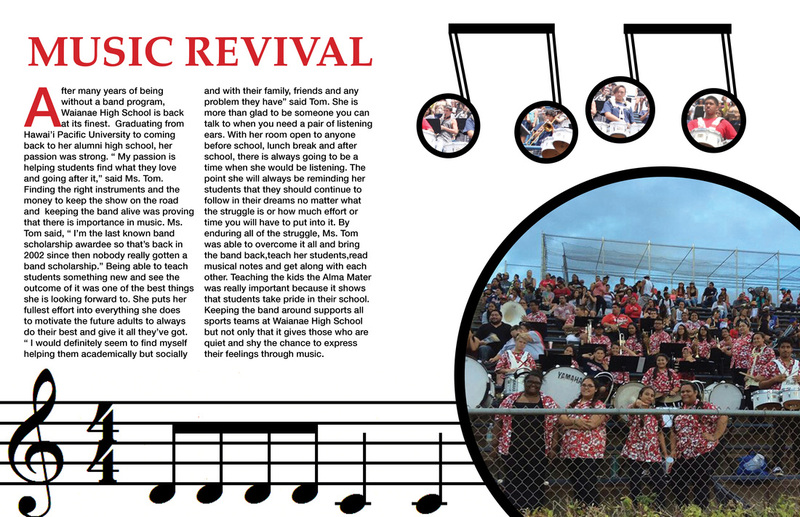 By enduring all of the struggle, Ms. Tom was able to overcome it all and bring the band back, teach her students, read musical notes and get along with each other. Teaching the kids the Alma Mater was really important because it shows that students take pride in their school. Keeping the band around supports all sports teams at Waianae High School but not only that it gives those who are quiet and shy the chance to express their feelings through music. This experience from the news cycle was hard. It look a lot of time in my personal life and class time. This news cycle was stressful yet interesting. 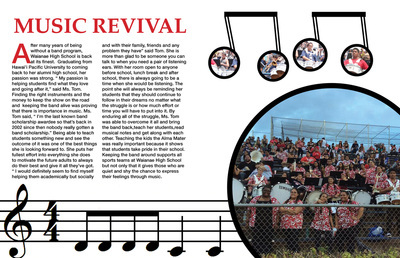 It showed me that someone still cares about our community by bringing back the band. 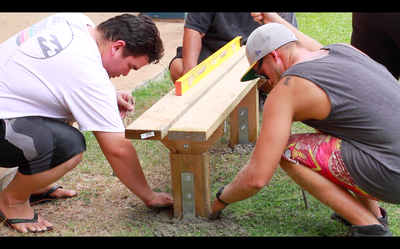 It’s a Friday morning and over twenty teachers and staff members of Wai`anae High School are joined together to get their hands dirty at the Wai`anae Campus Beautification Project. Among the many teachers and staff members present at the occasion was Michael Sturm, a teacher for the subject Transition to High School. According to Mr. Sturm, other staff members including himself “like to come out here and kind of like give back to the school”. 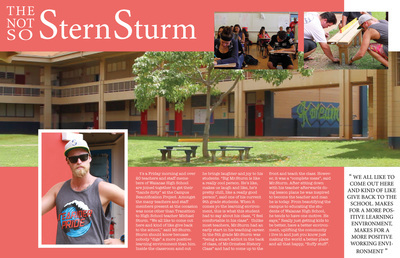 Sturm should know because nobody “digs” a more positive learning environment other than him. He brings joy and laughter to his students in and out of the classroom. However, for inside the classroom, current student says, ”Big Mr.Sturm is like a really cool person. He’s like, makes us laugh and like, he;s pretty chill, like a really good person”. When it comes to the learning environment, another current student feels “comfortable in his class”. Unlike most teachers, Mr.Sturm had an early start in his teaching career. He was born in Spokane, Washington and spent his days running around the woods. Just like any normal child he attended school. In the 5th grade, Mr. Sturm was being a smart aleck in the back of class, of Mr. Ormsbee’s history class and had to come up to the front and teach the class. 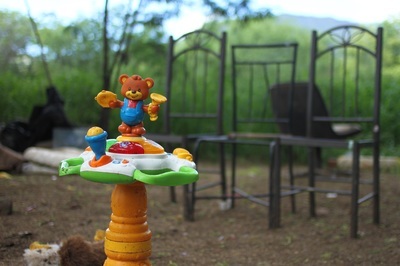 However, it was a “complete mess,” said Mr.Sturm. 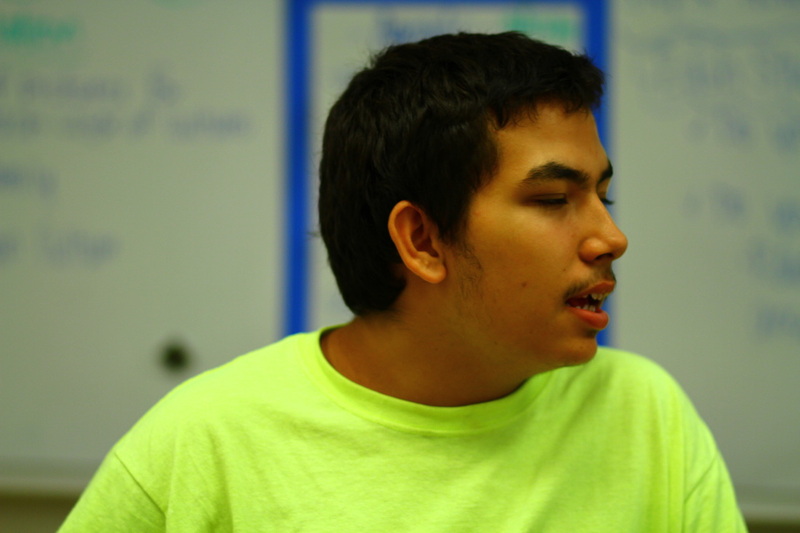 After class, he sat down with his teacher doing lesson plans, and was inspired to become the teacher and man he is today. From beautifying the campus to educating the students of Wai`anae High School, he’s a man with one motive: bettering his students. I did not realize the full dedication teachers have for our education and the school environment. 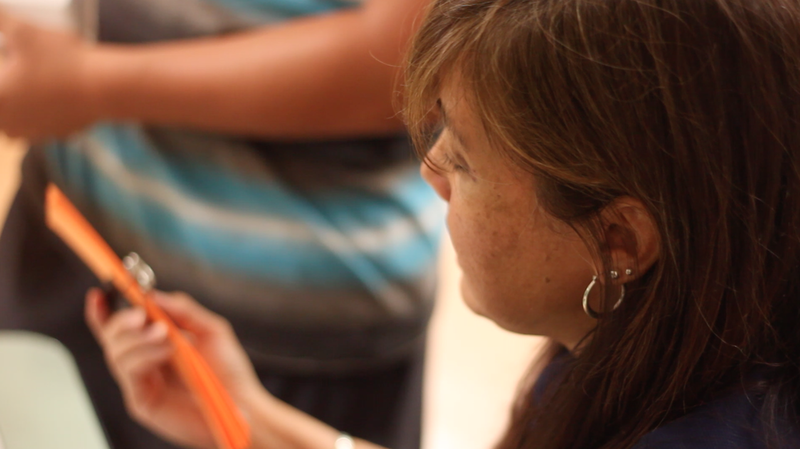 It is touching to see teachers who would go the distance to see students become successful. 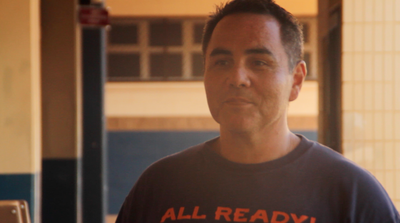 Wai`anae High School’s vice principal, Mike Kurose, is committed to making a difference. He volunteered for Seariders Service on August 21st of this year. The volunteer work consisted mainly of painting walls, installing new benches, and doing what he does best: having a positive impact on the lives of others. Mr. Kurose has worked at Wai`anae High School for nineteen years with one mission: making a difference. He started as a history teacher and after sixteen years he made the jump from educator to administrator. He is now the vice principal of the upper grade academy. 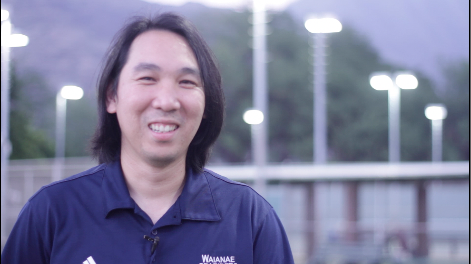 In the time that he has been at this school, Mr. Kurose has done his best for the students at Wai`anae High School because he believes doing his best for them makes them do the best for themselves. Over time, Kurose has been able to unearth the importance of what he is doing. 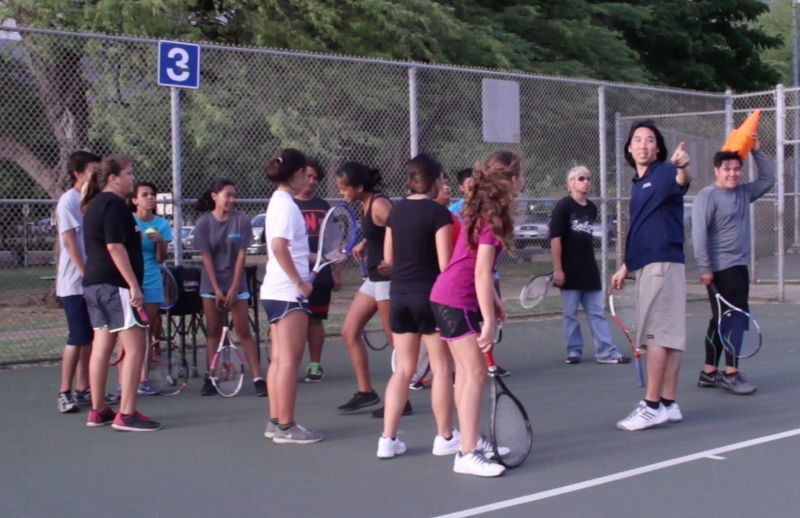 “I’ve been at this school, working with everybody and learning from the other adults here and, um, it has really dawned on me how important what we do is, how important [it is] that we have a passion,” Kurose said. 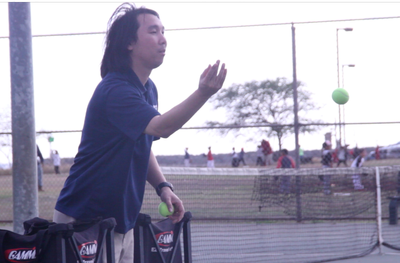 Mr. Kurose’s love for helping people by making a difference in their lives has become more important to him over time because he was not always the person that he is today. 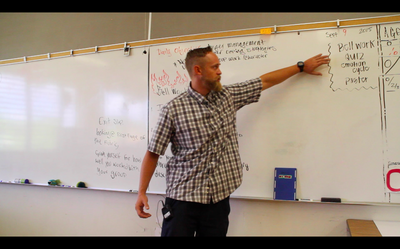 “I grew up in a way where I was not a very good student when I was going to high school especially, um, I did not have a whole lot of goals,” Mr Kurose said. His greatest inspiration to change came from seeing how hard his mother worked. 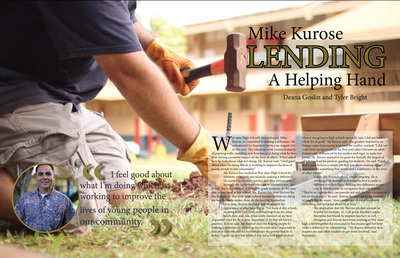 “I did not really have an appreciation for that until after I became an adult,” Kurose said. Today, Mr. Kurose’s efforts remain ongoing. He is working with students and doing his best to make a difference in their lives. Making this difference seems easy to him because he recognizes their capabilities. The inspiration that Mr. Kurose invokes extends far beyond his students. As 11th grade teacher Camila Hampton has found, he inspires teachers as well. 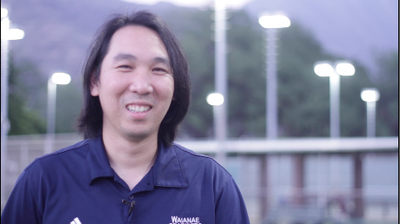 Hampton and Kurose have been working at Wai`anae high school together for years and he has encouraged her help make a difference by volunteering. “Mr Kurose definitely does inspires me and other teachers to get more involved.” said Hampton. 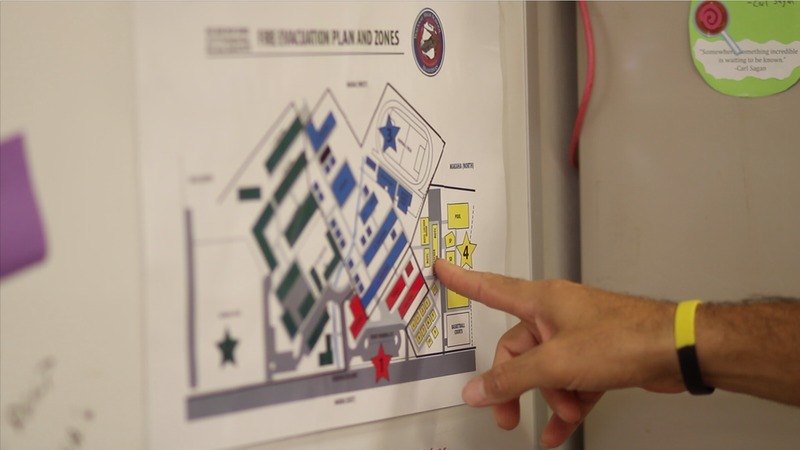 “That sense of community with the people I work with is the bigger reason why I’m here, we are all getting our hands dirty, we’re all working to make this place look, feel, and work better,” he said. 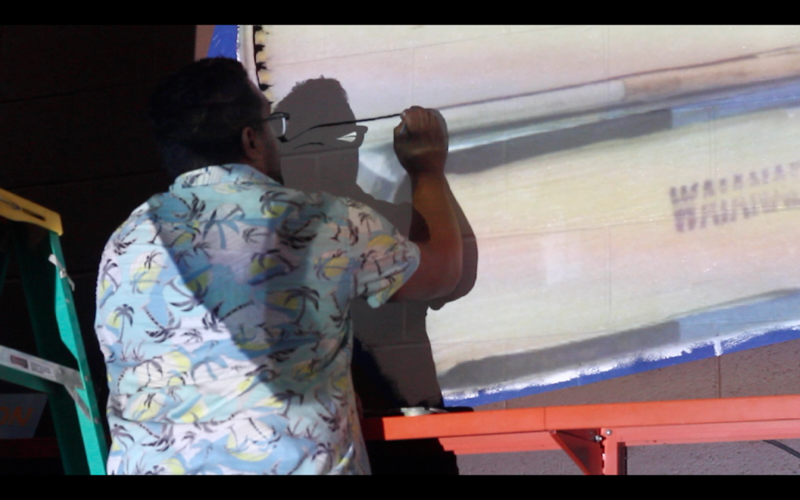 Although Mr Kurose is no longer a teacher he still wants to work with the students of his community in any way possible even if he has to do that by installing benches and painting walls. “We have a passion and we exert ourselves to the best of our abilities with the most open heart as possible to really try and provide the best experience for our youth,” he added. Throughout the process of making doing this project I learned quite a few things. One of which, was to pay close attention to detail. I learned from this news cycle that you should always be prepared for any situation that is thrown at you. In addition, its very important to get as much material as you can. 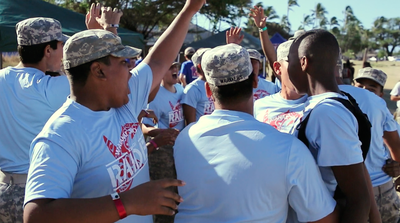 Every year, Waianae High School’s JROTC program hosts the Waianae Adventure Challenge, also known as the WAC. 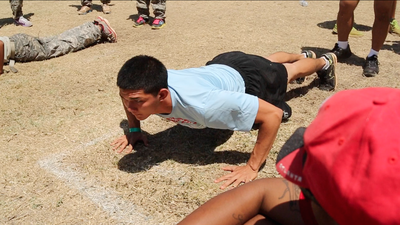 Which is a series of activities that put JROTC cadets to the test both mentally and physically. This year marks the 10th Annual challenge which hosted 74 schools from across the nation. Senior Nathanael Endo, who is also the Searider Battalion commander, uses the challenge as a preparatory step for his future career in the military. In the fall, Nathanael will be going to one of the most elite military colleges in the world when he attends West Point. 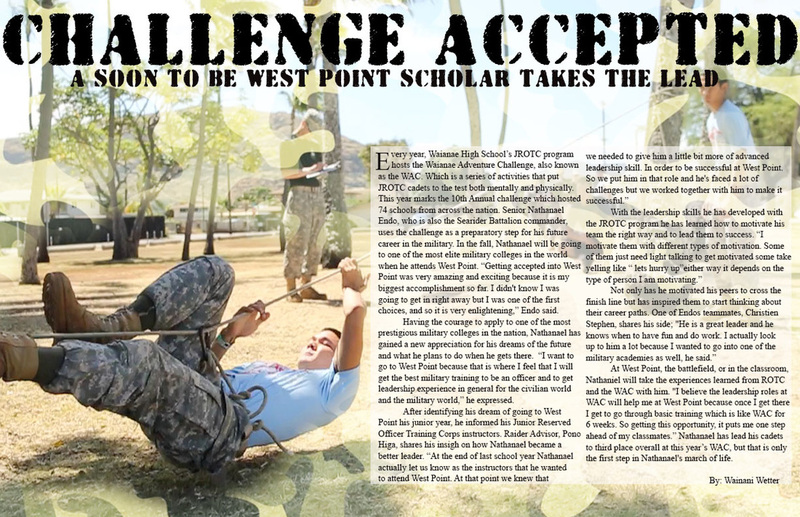 “Getting accepted into West Point was very amazing and exciting because it is my biggest accomplishment so far. I didn't know I was going to get in right away but I was one of the first choices, and so it is very enlightening,” Endo said. Having the courage to apply to one of the most prestigious military colleges in the nation, Nathanael has gained a new appreciation for his dreams of the future and what he plans to do when he gets there. “I want to go to West Point because that is where I feel that I will get the best military training to be an officer and to get leadership experience in general for the civilian world and the military world,” he expressed. After identifying his dream of going to West Point his junior year, he informed his Junior Reserved Officer Training Corps instructors. Raider Advisor, Pono Higa, shares his insight on how Nathanael became a better leader. 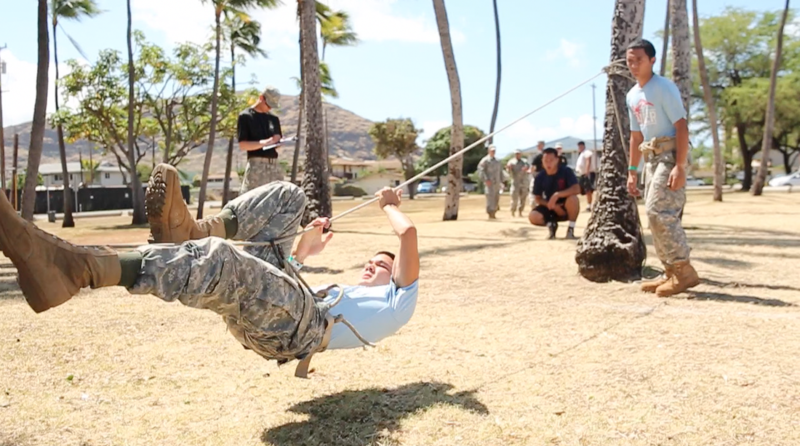 “At the end of last school year Nathanael actually let us know as the instructors that he wanted to attend West Point. At that point we knew that we needed to give him a little bit more of advanced leadership skill. 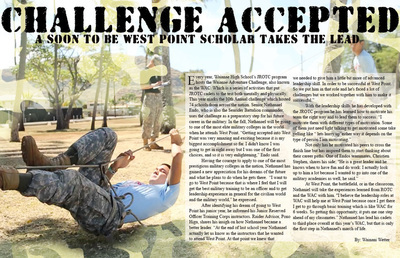 In order to be successful at West Point. So we put him in that role and he's faced a lot of challenges but we worked together with him to make it successful.” With the leadership skills he has developed with the JROTC program he has learned how to motivate his team the right way and to lead them to success. "He is a great leader and he knows when to have fun and do work. I actually look up to him a lot because I wanted to go into one of the military academies as well, he said.” At West Point, the battlefield, or in the classroom, Nathanael will take the experiences learned from ROTC and the WAC with him. "I believe the leadership roles at WAC will help me at West Point because once I get there I get to go through basic training which is like WAC for 6 weeks. 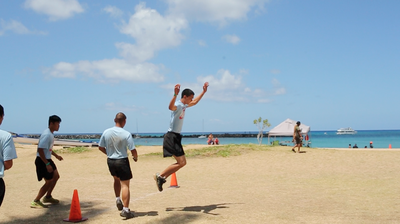 So getting this opportunity, it puts me one step ahead of my classmates.” Nathanael has lead his cadets to third place overall at this year’s WAC, but that is only the first step in Nathaniel's march of life. With 40 acres of land and nearly 2000 students, Waianae High School’s security guards have a lot of ground to cover. 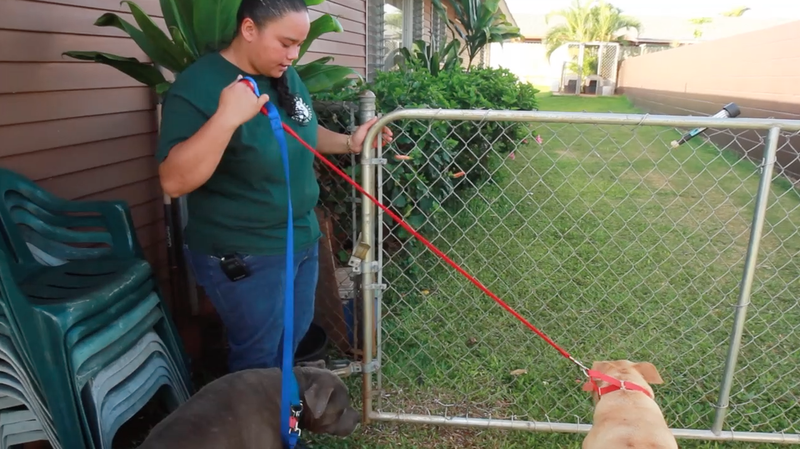 With only six guards on staff, they’ve taken it upon themselves to increase their numbers. “We’re at 6 right now and we have allotted 2 more spots so there will be a total of 8 total on campus, hopefully before the school year concludes,” said security guard Kaleo Searle. The high school is divided into “zones” that each security guard is responsible for. Although golf carts are currently the primary mode of transportation, the increase in staff opened the door for a new set of wheels. 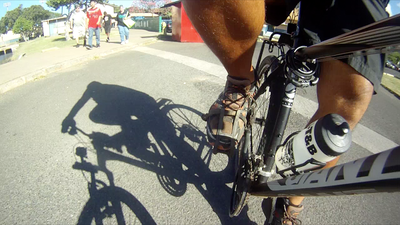 “To have that accessibility and response time to incidents to be quicker, as opposed to being on foot, that is the purpose behind getting the bicycles,” Searle said. 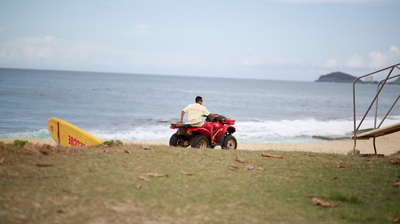 Golf carts can cost several thousand dollars each, with maintenance costing even more. 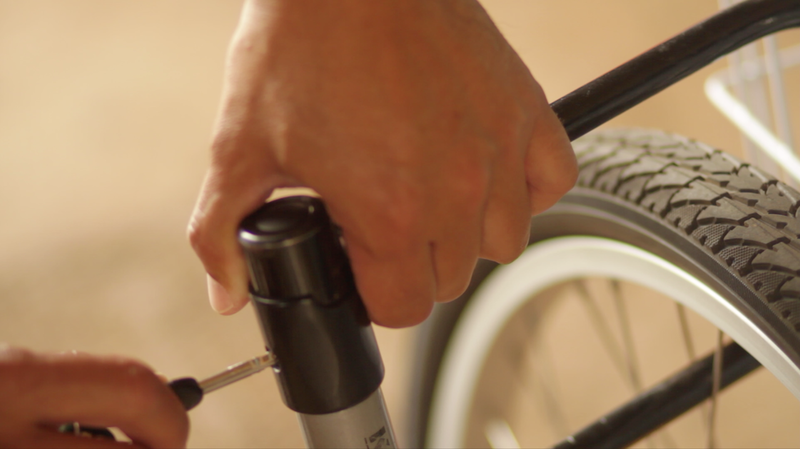 At only $200 each, bicycles are a healthier and more cost-effective alternative. 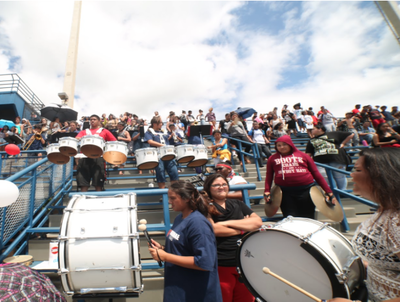 “They’re actually pretty cool, um it’s great for the security guards to be on their feet, you know, being active, moving,” said sophomore Chloe Yniguez. 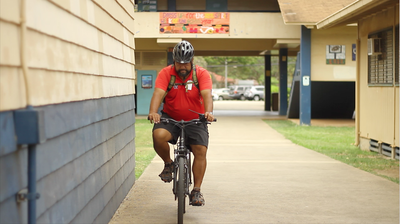 While the bikes were initially intended as a financial solution, they ended up causing a chain reaction throughout the school. Now, other departments are switching gears. 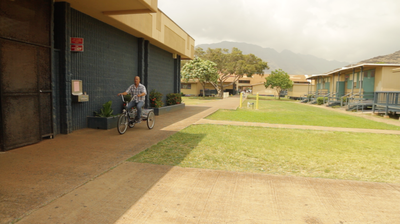 Other staff members such as tech coordinators and custodians have also begun to use bicycles to get around. 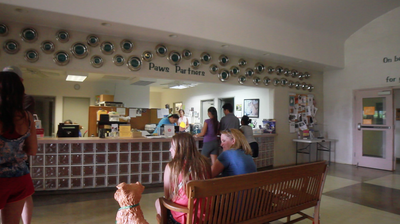 “I think they’re fun and they help me get from one place to another really quickly. Um, with my job, I walk all the way over the campus and it’s a quarter mile round trip from the front to the back of the school,” said tech coordinator Cory Tom. Tricycles with baskets are also helping other staff around the school take a heavy load off their shoulders. “I think it’s a really great thing for me personally, because I have, I usually do 20 trips, 30 trips a day, so getting from the front to the back, really convenient for me,” said custodian Mary Oshima. 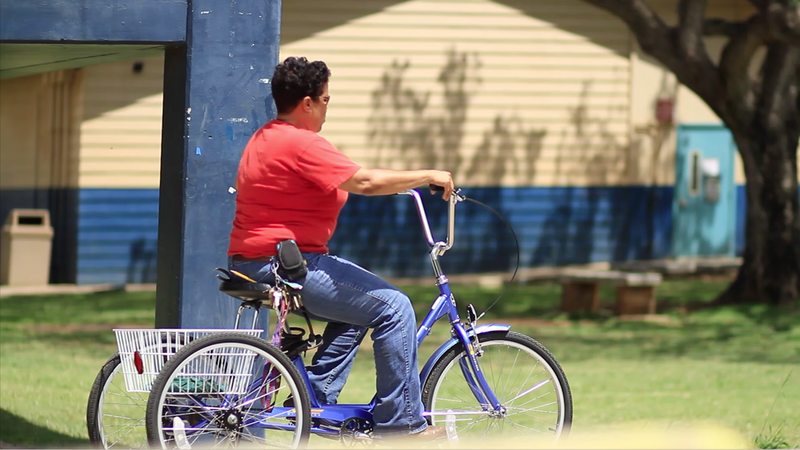 With their new mode of transportation, the staff are finding it easier to handle their daily responsibilities, and enjoy them too. “I thought it was Christmas cause we usually don’t get stuff like that, to help us make our job easier, so it was a really great thing for us,” added Oshima. Wrestling usually evokes images of muscular athletes pounding each other in a violent manner; it is not typically recognized as a sport that is inviting to women. Although it is considered a male dominant sport, that stereotype doesn’t apply to the Waianae High School Seariders. 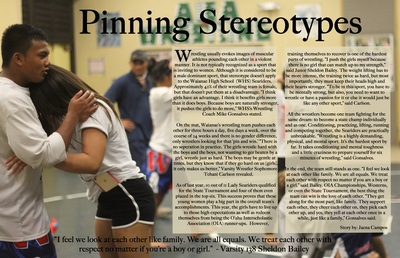 Approximately 42% of their wrestling team is female, but that doesn’t put them at a disadvantage. "I think girls have an advantage. I think it benefits girls more than it does boys. 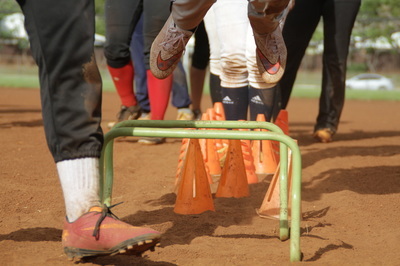 Because boys are naturally stronger, it pushes the girls to do more," Coach Mike Gonsalves stated. On the mat, Waianae's Wrestling Team pushes each other for three hours straight, five days a week, for 24 weeks and there is no gender difference, only wrestlers looking for that ‘pin and win.’ "There is no separation in practice. The girls wrestle hard with the boys and the boys, not wanting to get beaten by a girl, wrestle just as hard. The boys may be gentle at times, but they know that if they go hard on us [girls], it only makes us better," Varsity wrestler sophomore, Tehani Carlson revealed. As of last year, 10 out of 11 Lady Seariders qualified for the State Tournament and four of them even placed in the top six. This success proves that these young women play a big part of the overall team's success. 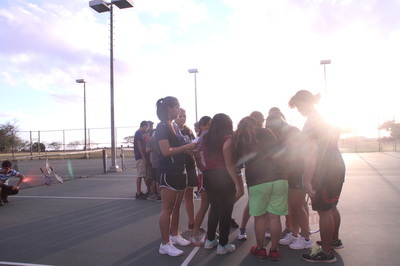 This year, the girls have to live up those high expectations as well as redeem themselves from being the O’ahu Interscholastic Association (OIA) runner-ups. However, training to recover themselves is one of the hardest parts of wrestling. 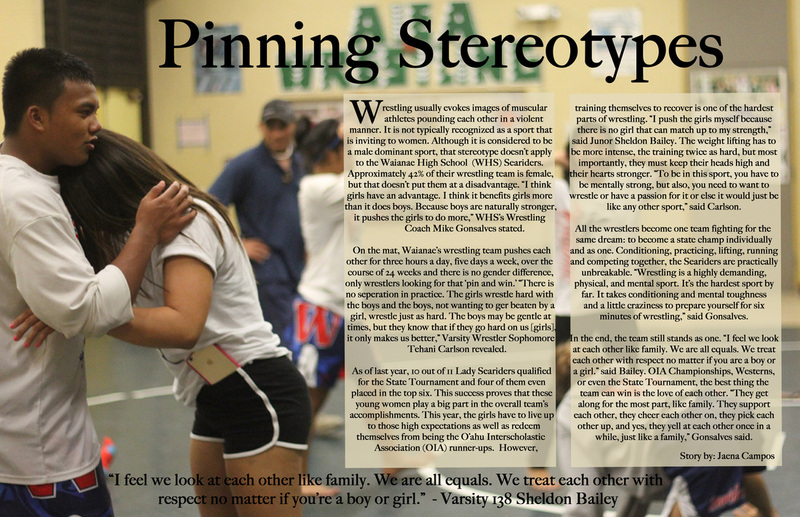 "I push the girls myself because there is no girl that can match up to my strength," said Junior Sheldon Bailey. The weight lifting has to be more intense, the training twice as hard, but most importantly, heads high and their hearts stronger. "To be in this sport you have to be mentally strong, but also, you need to want to wrestle or have a passion for it or else it would just be like any other sport," said Carlson. All the wrestlers become one team fighting for the same dream: to be a state champ individually and as one. 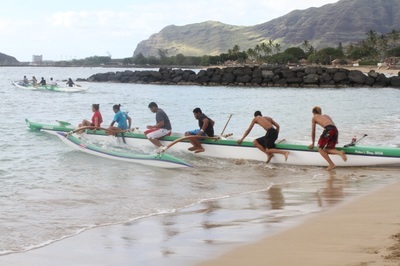 Conditioning, practicing, lifting, running and competing together, the Seariders are practically unbreakable. "Wrestling is a highly demanding, physical, and mental sport. It's the hardest sport by far. It takes conditioning and mental toughness and a little craziness to prepare yourself for 6 minutes of wrestling," said Gonsalves. In the end, the team still stands as one. “I feel we look at each other like family. We are all equals. 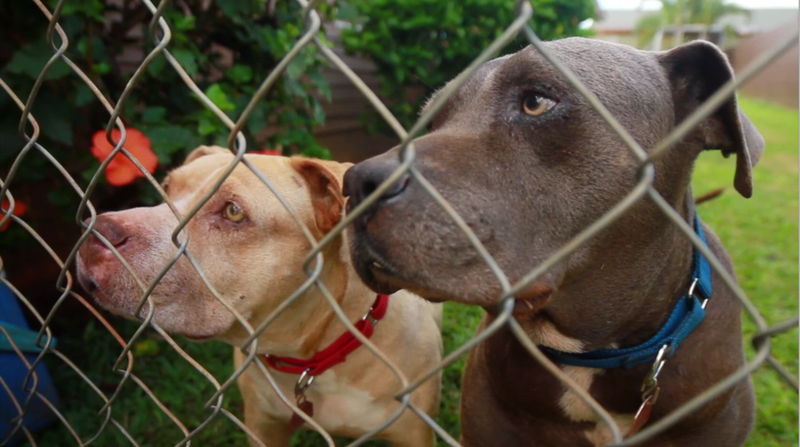 We treat each other with respect no matter if you’re a boy or girl,” said Bailey. OIA Championships, Westerns, or even the State Tournament, the best thing the team can win is the love of each other. "They get along, for the most part, like family. 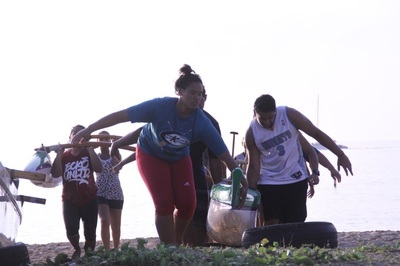 They support each other, they cheer each other on, they pick each other up and yes, they yell at each other once in awhile, like a family,” Gonsalves said. 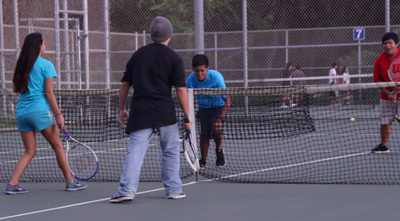 Tennis is not commonly recognized as a team oriented sport. 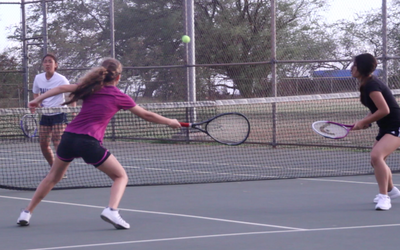 Even the greatest tennis players are usually known for their independent achievements and championships. However, for Waianae High School’s tennis team, they can’t spell tennis without t-e-a-m. The idea of teamwork and having fun is the most important concept for these Seariders to understand. “Its good to build that team bonding feeling so everybody feels like they're being supported no matter who’s on the court, we got someone in their corner rooting for them,” said Coach Brent Yamagata. Building the bond for these players is what makes them different from other teams. While opponents may focus more on wins, this team never forgets to have fun. Fun for them is not just the movie or beach dates, it’s the sport itself. “We emphasize the sport as competitive, but we also want them to have fun, and when they start to have fun they have a really good bonding experience,” Yamagata said. To find their perfect balance, the team exercises both their bodies and their sense of fun. They create nicknames from adjectives that represents a positive characteristic of each player. This way, the team members will always be positive towards one another and become even a stronger team. “There will be a day that we will be like everybody call each other by their adjectives and not by their first name.” In tennis they also use their rankings of their abilities to create a stronger bond. They see the players who are struggling and help each other get better both as an individual and a team. “They start to play with each other a lot more and see each others weaknesses and that way they can help them out,” said Yamagata. Positivity is what also keeps these Seariders going throughout the season. With the help of Freshman Elizabeth Ufi, positivity is not hard to come by. 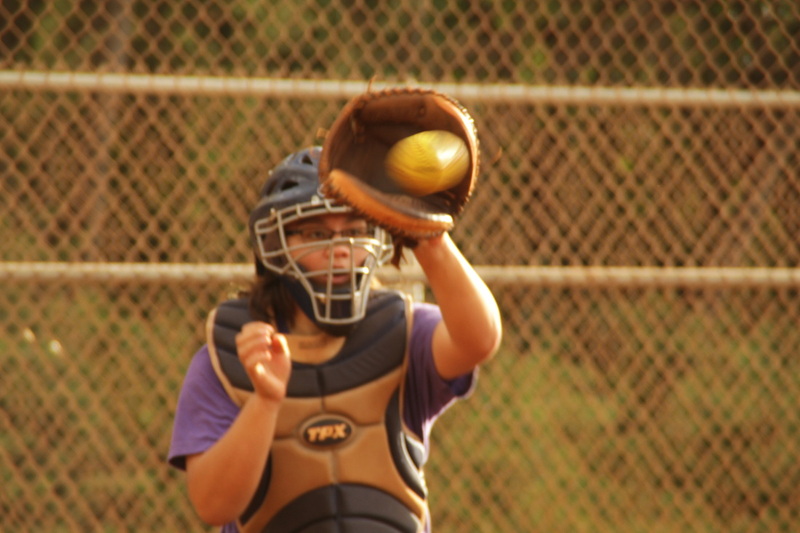 She encourages the other people on the team to do their best both as a team and an individual. 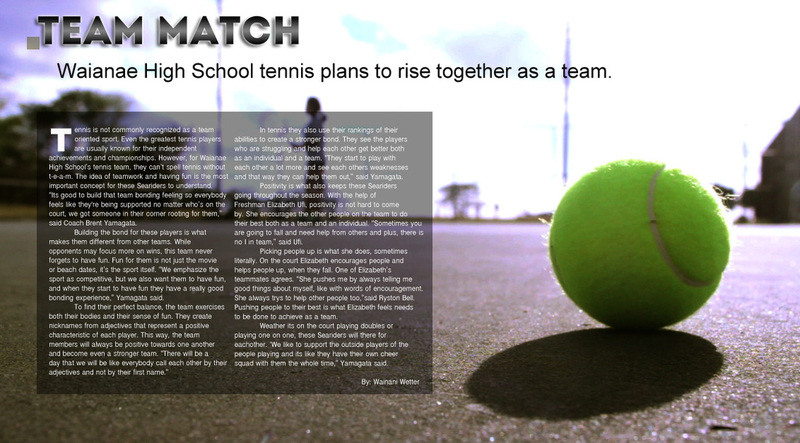 “Sometimes you're gonna need someone to pick you up, I believe that there is no I in team and tennis is not just one man show,” said Ufi. Picking people up is what she does, sometimes literally. On the court Elizabeth encourages people and helps people up, when they fall. One of Elizabeth’s teammates agrees. “She pushes me by always telling me good things about myself, like with words of encouragement. 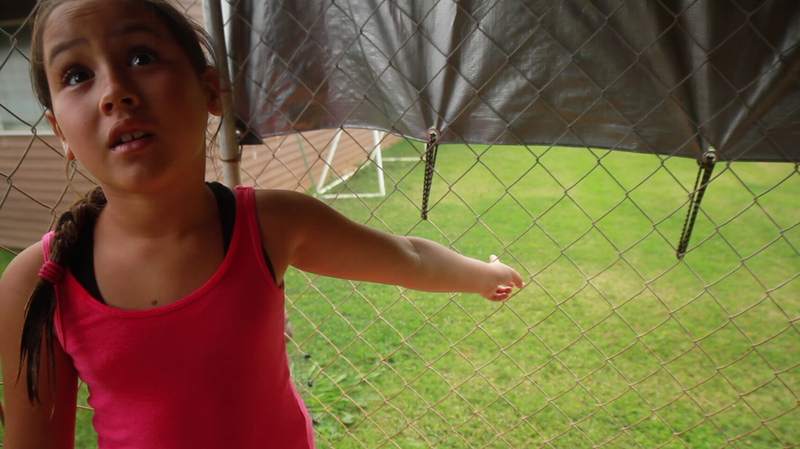 She always tries to help other people too,”said Ryston Bell. Pushing people to their best is what Elizabeth feels needs to be done to achieve as a team. 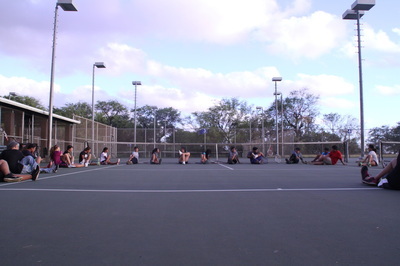 Weather its on the court playing doubles or playing one on one, these Seariders will there for eachother. ‘We like to support the outside players of the people playing and its like they have their own cheer squad with them the whole time,” Yamagata said. 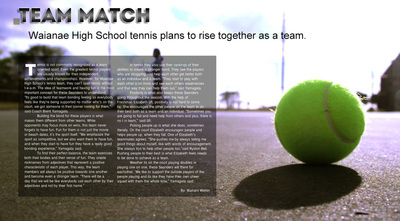 "I found the high school tennis team to be one of the nicest group of people I have ever met." 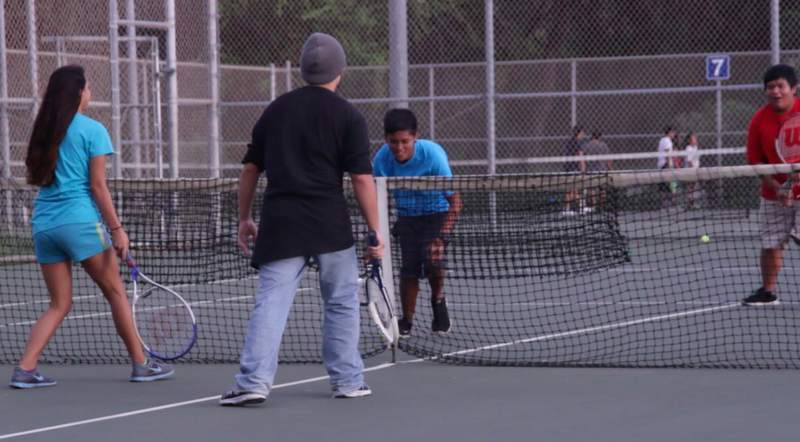 ﻿"Watching them practice, has influenced me to get back into doing physical activities." Moving up is something that everyone does, whether it’s in a job position, class rank, or sport. 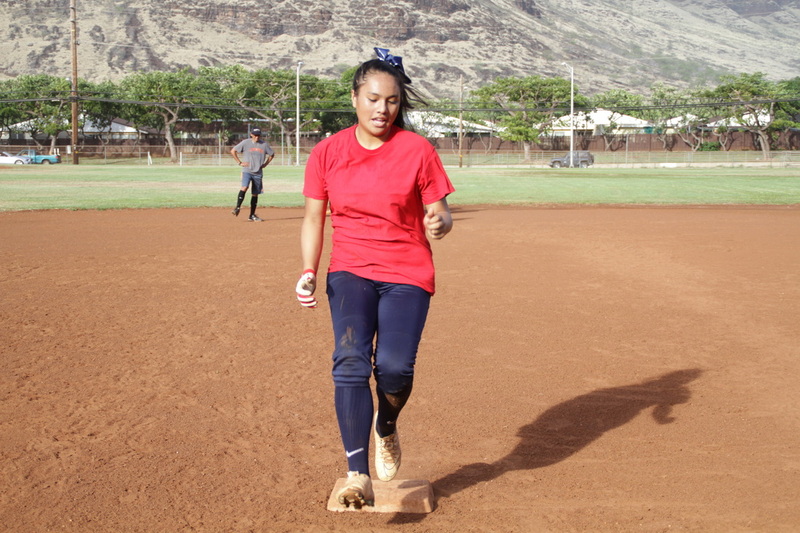 In sports, it’s not always the easiest thing to go from one position to another, but for the softball girls at Waianae High School, it comes as a second nature. 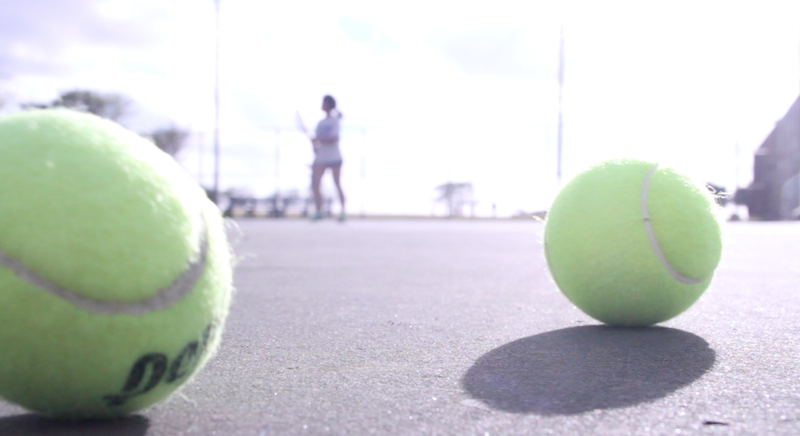 For Sophomore Chrisann Rabanes, there’s no where to go but up. Chrisann has been playing on Waianae high school’s junior varsity softball team for the past two years and this may be the year she moves up to Varsity. Chrisann is not the only sophomore trying out for Varsity. states Charlie Pittman. 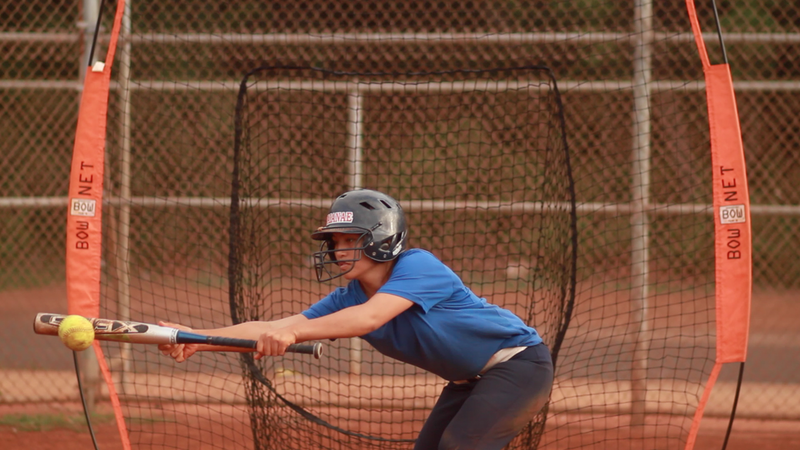 Last year, Waianae’s junior varsity softball team made it to finals, but for this season, the girls don’t know what to expect from their new team and more importantly, their new teammates. ““I feel really confident about the outcome for this year, I just hope I can get along with the other varsity girls.” states Charlie Pittman. 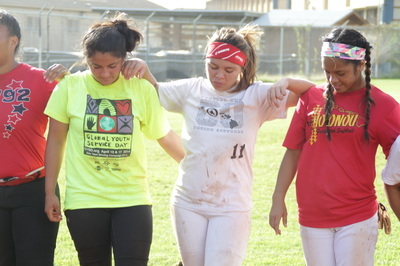 Although the “newbies” have many challenges ahead of them, the returnee softball girls are willing to lend them a helping hand. “I have faith in the new girls on the team and I’m sure they’ll do great. I remember my first year coming up to vars and I was really scared because I knew the girls on the team would expect more from me and the coaching would be more rigorous but I just did what I was told and I got along just fine with the older girls so I just want to be as supportive of the younger girls as the older girls were of me.” states Senior player Breani Simpson. ﻿"Watching some of these girls made me think that they work really hard to get to where they are now." ﻿"I've learned that moving up is something hard to do but it's not impossible." 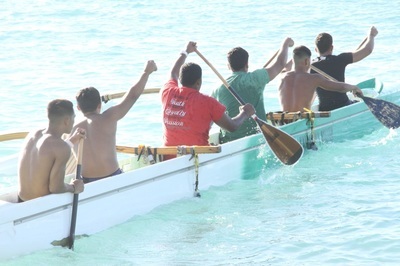 In the sport of paddling, a team has to be in unison to row the canoe smoothly. One motion, one team, in sync or else the boat will fail to move. 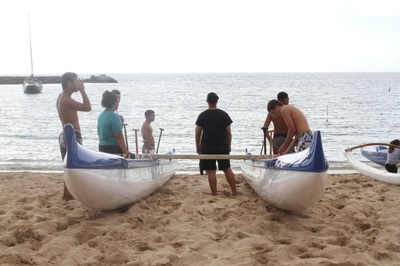 Waianae High School’s paddling team works hard to embody that concept of unison. “We do everything together. 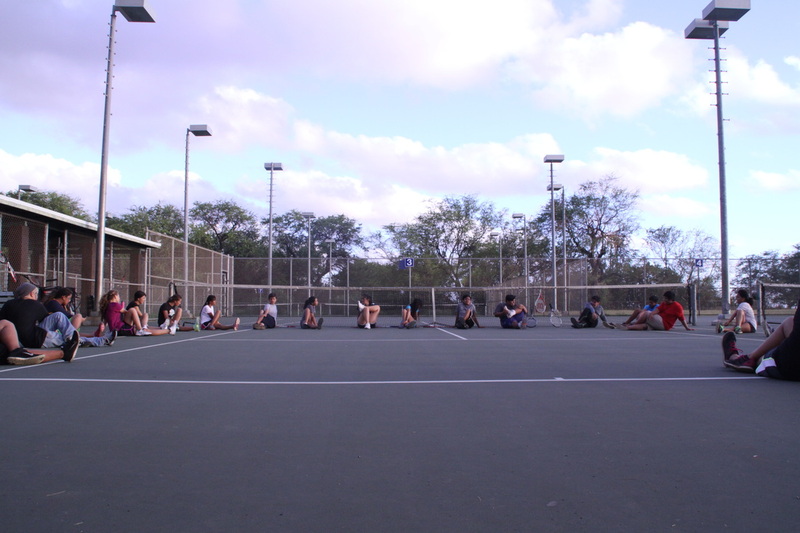 I mean, down to talking to each other, down to exercising together,” head coach, Delveen Eli said. 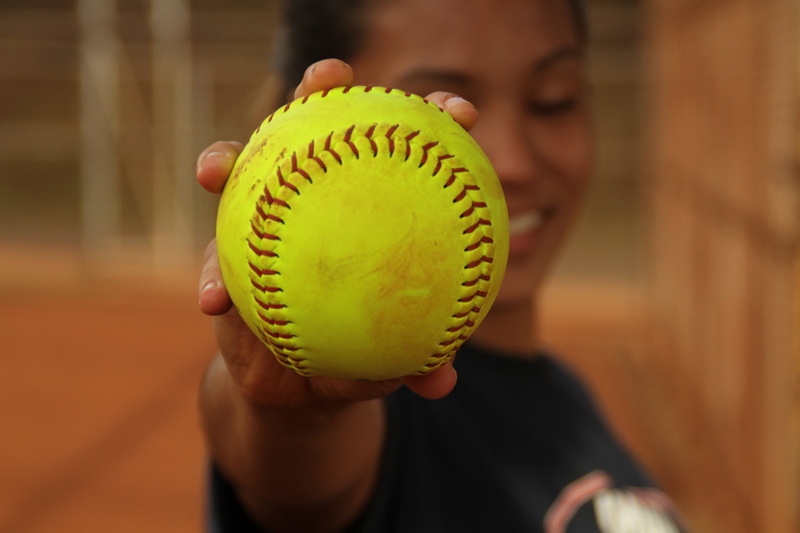 Their hard work and dedication to a team bond paid off last year when they were OIA champions for the girl’s division, and won the Tesoro Cup, which honors the team that scores the most points in a season, for the second time. 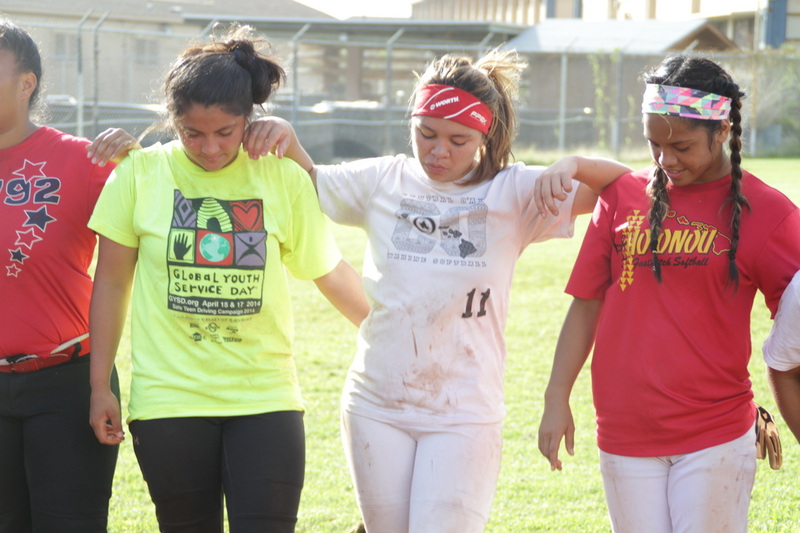 “If you have a bond then you’re unbeatable because it doesn’t matter if you win or lose cause you consider yourself winners because you worked together,” Kamaile Academy senior, Kamalani Pule said. In the team, everything is done together, strengthening their sense of teamwork. “We don’t separate anybody here meaning we don’t separate JV. We do it as a team. Meaning we practice all together, we do everything together,” head coach, Delveen Eli said. This friendship within the team also goes beyond the beach. “For starters we have sleepovers. Most of us sleepover each other’s houses on friday nights, we go movies, we have a connection outside of paddling as well as inside of paddling. Most of the team love the beach so half of the time we’re at the beach,” Kamaile Academy senior, Kamalani Pule said. As the season goes on, bonds are strengthened, creating one unit. 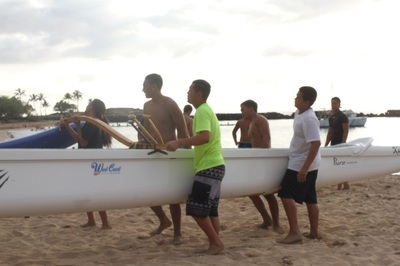 “We all do stuff together, we all work together, we paddle together, we do everything together, so that makes us a family,” junior, Blaise Gonzales said. Within the team, they know that they can turn to one another. 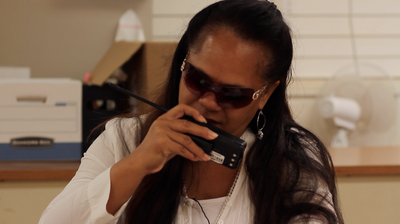 “I know that it I need Aunty Del or Uncle Wil, I can call them or anybody on my team,” Kamalani said. With such a close relationship, their paddling only improves. “The only one that actually supposed to be talking in the boat is #6, but if our powerhouses, meaning 3,4, and 5, is not feeling it in the boat, they let 1, which is our stroker, know that they gotta stretch it out more and pushing each other,” Delveen said. It only brings them a step closer to their goal. With their past success hanging over them, WHS’ paddling team are training to come back even harder this year. In a few weeks, they will be on their way to Maui for the state championships where 32 of Hawaii’s best will be competing. 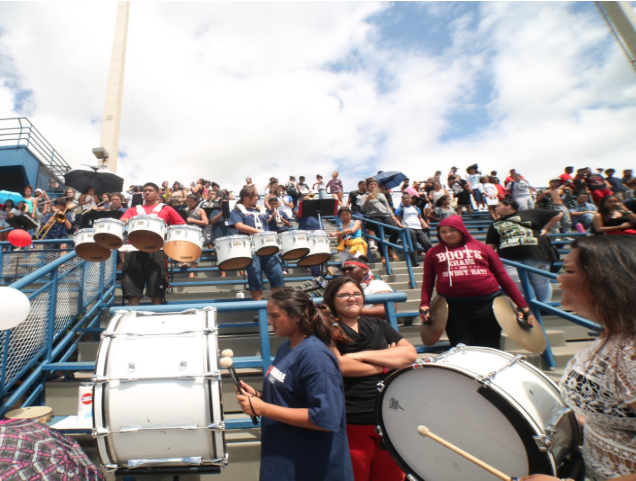 “Our goal is to reach the state race which is, the top 6 from its its school goes to the state and every island has a different seat inside,” Wil said. This determination to win pushes them to work even harder, but winning isn’t their main priority. 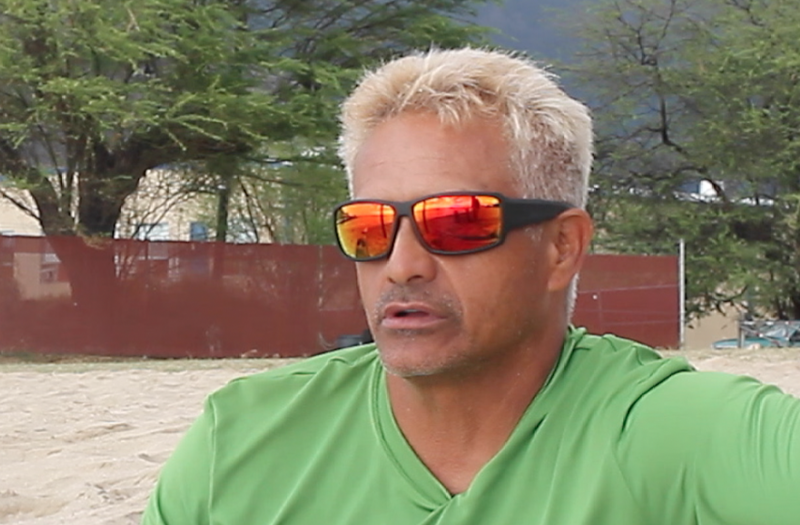 “When we go out and go to races, we always tell them the #1 thing is you win here, at waianae, at pokai bay,” Delveen said. 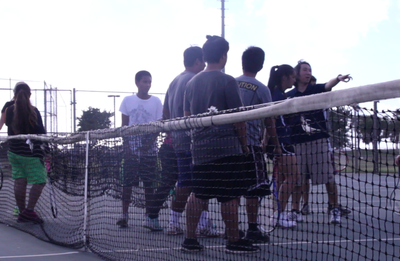 Though the team's focal point is teamwork, this focus is what is bringing them a step closer to the win. ¨After a win we feel the adrenaline and you just feel like a champ and that you can accomplish anything,” Blaise said. In the team, it's the bond that really matters to the coaches. "If they can work together and communicate with each other, their bond is going to be so strong that nothing can break them," Wil said. Whether they win or lose states, the relationship they have as a team will never fade. 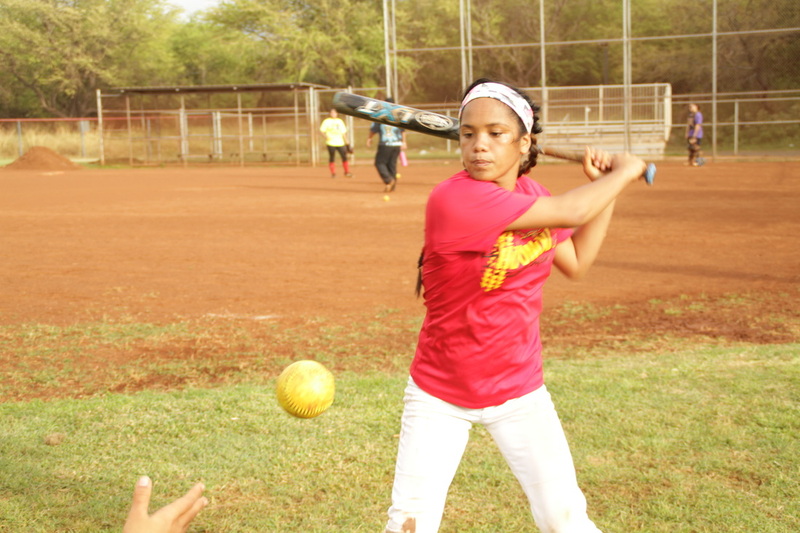 “I have made friendships that will last a lifetime and i think you can only get that here,” Kamalani said. "I liked seeing how the team interacted with each other. From them I learned that even though you work hard, you can still have fun. " ﻿"I learned that having a bond is very important. I also learned that having a strong bond can helps a lot, it makes communication easier." Successfully graduating high school has many requirements; doing homework, passing tests, and the famous senior project. Every senior that attends public school in the state of Hawaii must complete a senior project that allows them to walk across that stage and into the next chapter of life. From research to life changing decisions, the senior project helps seniors get on the right path to a brighter future. "The senior project is an opportunity for our seniors who are finishing up twelve years of education and getting ready to move into the real world. 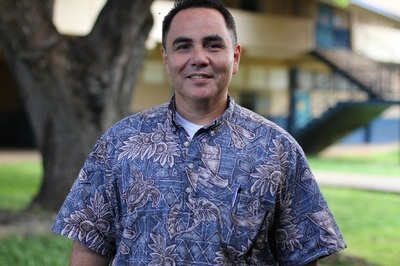 there is an english project that is about a seven page paper and then there is a senior project which qualifies you for the recognition diploma which is a ten page paper, a presentation and evidence that you are giving back to your school and your community," said Waianae High School principal Disa Hauge. 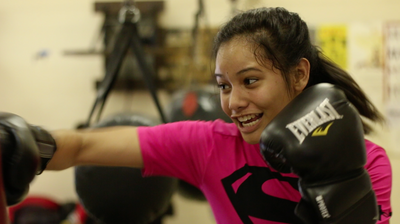 Senior Dani Kaohe-David is kick starting her senior project by going back to her martial arts roots. "I started taking karate originally to be closer with my family since I am an only child I didn't really have anyone to hang out with. I joined karate to be closer with them when they moved away," said Dani. Karate is more than just a comfort to Dani, it is home. Dani started karate when she was ten years old and earned her black belt just two years later. In trade for becoming the best she had to compete. "Competing for me actually made me very competitive and it made me want to work hard." After years of sweat and dedication to her skills, Dani decided to stop karate when she went to high school in order to pursue new challenges. "I stopped karate because it was my freshman year of high school and I wanted to try something totally different, so I chose cheer." Now, in her senior year, she is putting her "gi" and black belt on for her senior project and taking on the new challenge of teaching. "I wanted to help out and teach people like how I was taught and just learn the ropes. I know I am giving up my time and even though I am not getting paid, it rewards you in a different way," she explained. 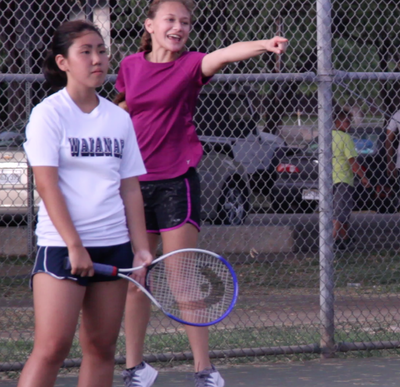 Although she is giving up her time, Dani seems to be breaking through her senior year with the Japanese way to yell, the kiai. Like any teacher, Dani finds the silver linings within her project. 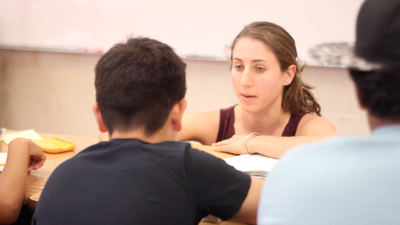 "My favorite thing about teaching is when the students are finally catching on after the amount of time you put in. Even though they are happy you feel like a sense of accomplishment and you did something, and it feels good." 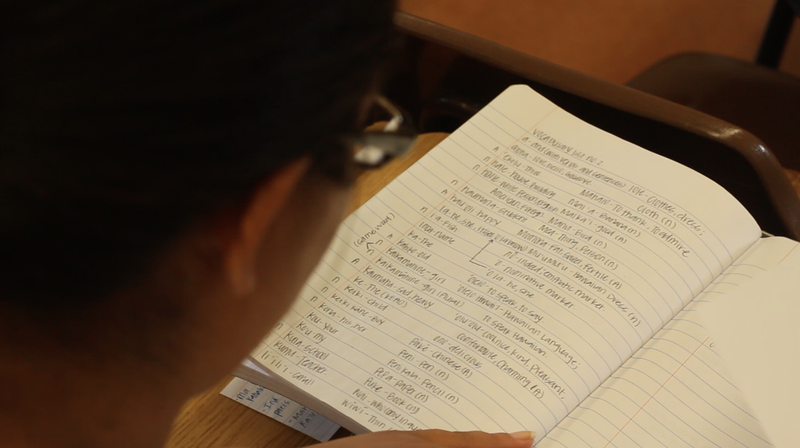 As she teaches she realizes that not only does she love to teach, she realizes the struggles that any teacher goes through on a daily basis. "Teaching is hard and I now know how teachers feel when students don't listen. It's hard being a teacher but it is rewarding," she said. Dani is giving back what she has gained from her past instructors by paying it forward with the next generation of karate students. Her senior project is meaningful and she is enjoying every moment, for she is getting in touch with her inner warrior. 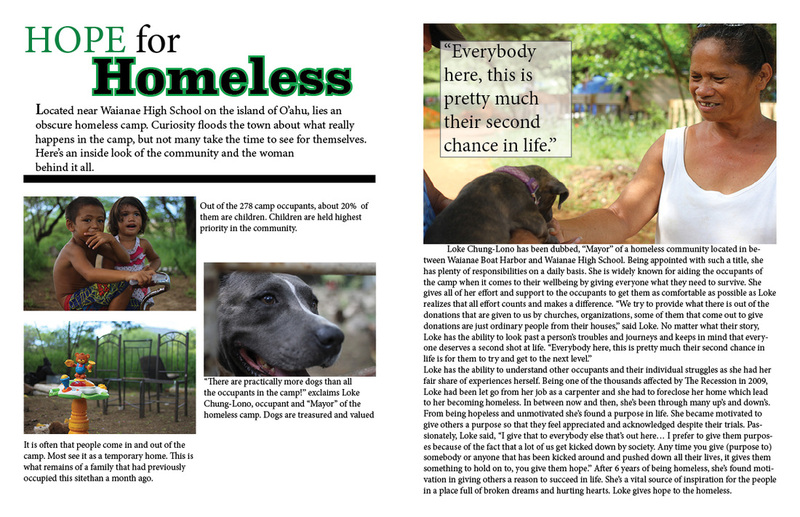 As many other seniors complete this project they have a chance to discover their newfound passions, just like Dani. 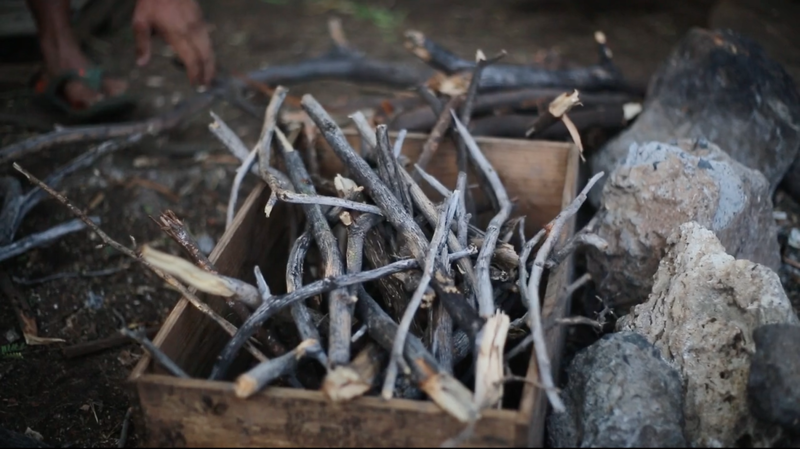 ﻿"I realized that you can reconnect with your roots in ways unexpected." 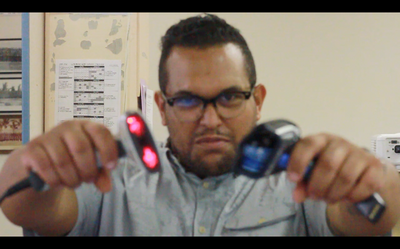 This year, Waianae High School (WHS) has decided to attack a long time problem in a new way. At the beginning of this term WHS implemented a new attendance and tardy policy to help combat the large number of student absentee issues. 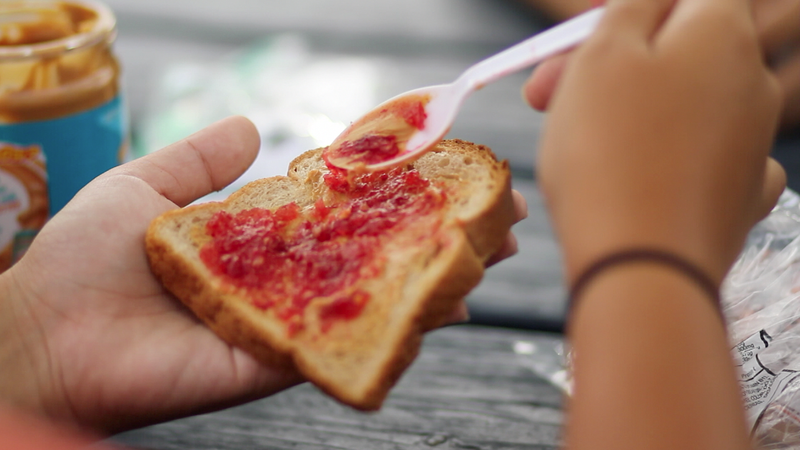 “We had over 100 students being tardy at first and third period which is the beginning of school and right after lunch,” Vice Principal, Michael Kurose said. The new system is built on a series of consequences in order to get students to be in class on time and ready to learn. The first three tardies are considered a warning, then afterwards, the consequences grow more severe. After the fourth tardy, there comes after school detention, Saturday school, and weekend detention. Although the repercussions are severe, the administration’s intentions are good. “We really want our students develop good habits now so when they do go to their careers you know they’ll be ready for it,” Kurose said. Although the administration feel that the policy will benefit students in the future, students are not feeling very appreciative of the new system. “I think the new system is stupid, because it punishes students who actually have a reason for being late,” sophomore Kesiah Castellano said. Students also have found other flaws or loop holes in the system. 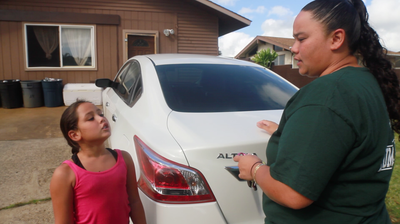 “Instead of coming to school late and getting detention or something, you could just stay home and get an excused absence,” freshman, Kylie De La Cruz said. 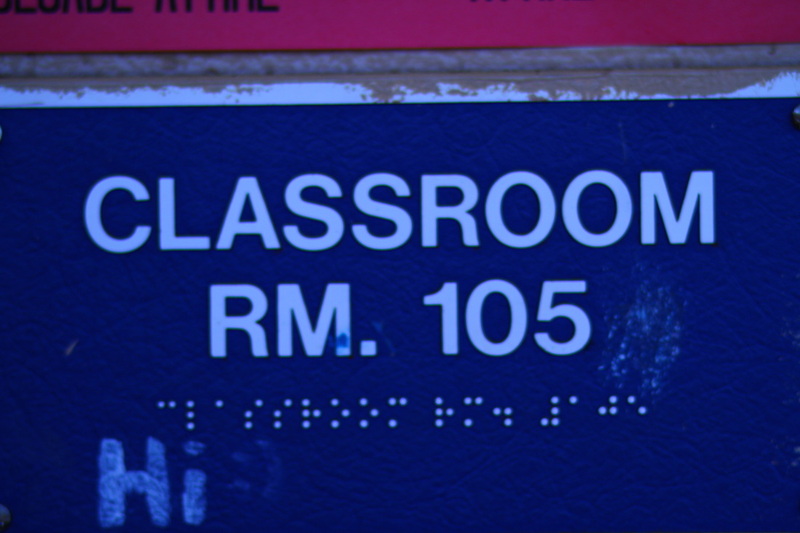 While some students see the policy as a negative, teachers have a different opinion on the situation. “The tardy system actually brings students to class on time. You either come when you need to, or face the consequences. It’s on you,” English teacher, Scott Bondurant said. Despite the issues within the system, it has been upholding its promise. 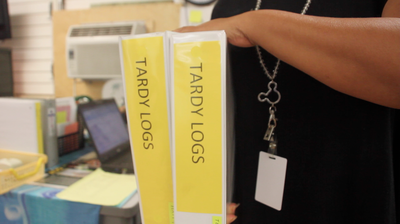 “In the month and a half that we’ve had this system, the number of tardies have dropped significantly,” Kurose said. 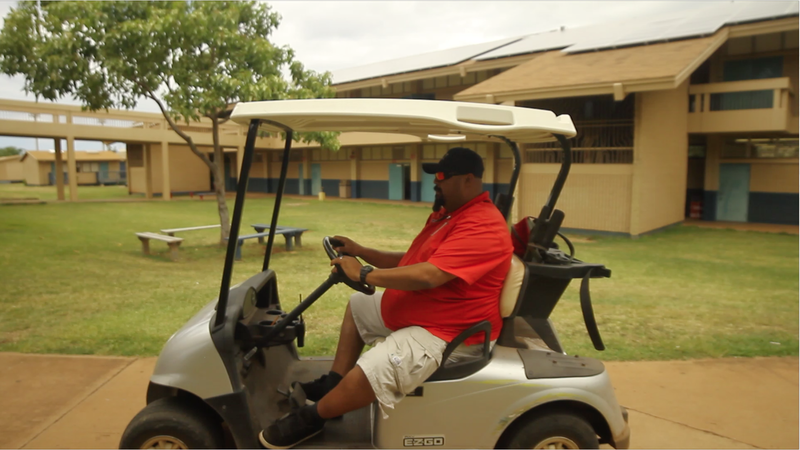 This tardy system’s purpose is to train students to be punctual, but it’s only a small step in Waianae High School’s long term goal. “We want to not have a punishment system that kinda prevents students from not coming tardy, but really for the students to understand what is the purpose of this school and how being on time benefits them not just in learning the stuff they gotta learn in their classes, but also in their future careers as well,” Kurose said. 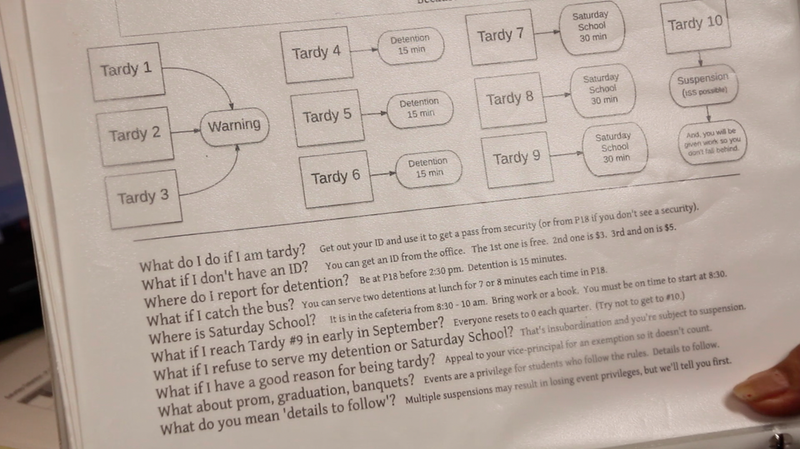 Although students may not see the good intentions behind the tardy policy, WHS’s administration knows that their being punctual will help them in the future. "I learned that this new tardy system isn't as bad as it really seemed." ﻿"I learned that although the tardy system seems bad to most students, it actually has positive intentions." 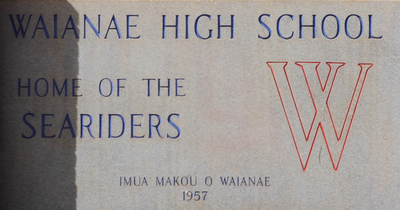 Waianae High School (WHS) is infamous for it’s history of on campus violence. “We are saddled with an image that outsiders have of us as a place where it’s rough and a place where sometimes not such good things happen. 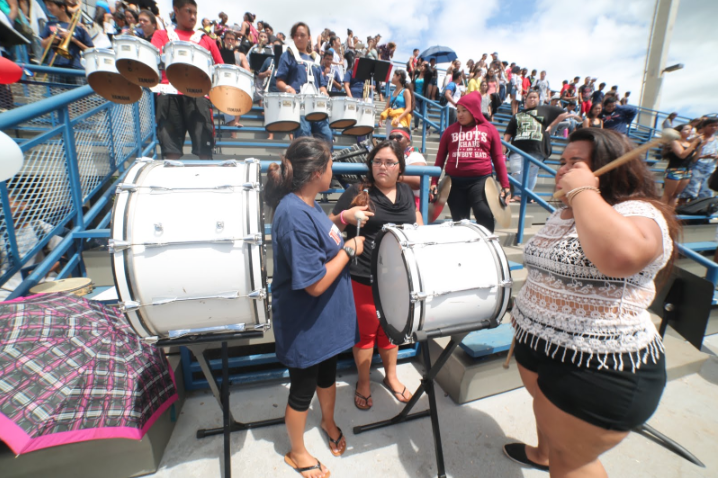 We who live here know that’s not true all the time,” Waianae High School Principal Disa Hauge said. While that stereotype doesn’t apply all the time, it still has a large impact on the school. 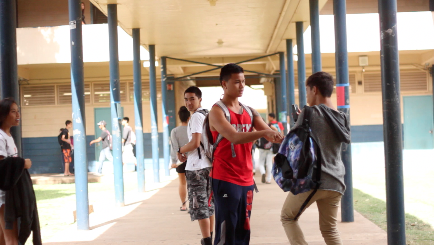 According to WHS Dean of Students, Dean Shimada, there are about 182 fights per school year, which averages out to one fight per day. “Most of the times, it’s just typical injuries from a fight; bruising, cuts, bleeding. The ultimate danger is that someone would get seriously hurt or fatally hurt. 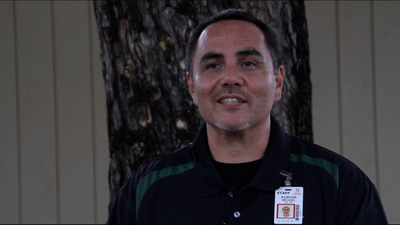 Luckily, we haven’t had that,” WHS Vice Principal Ryan Oshita explains. 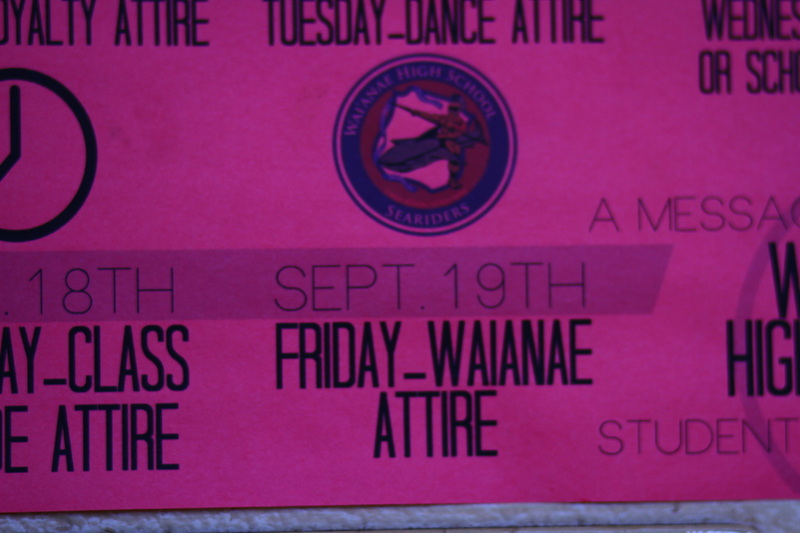 Despite all of the negativity, Waianae High School is doing something to change their image. “Waianae High School has an image of itself, that is very proud and very connected to where people came from and this land that we live on,” Hauge stated. According to the WHS student handbook, fighting is a class-A offense that may result in ineligibility of the violator to participate in co-curricular activities. In just 20 years, there has been significant improvement. “When I first started working here which was back in ‘94, ‘95, we had huge riots where a mass of kids would be running, chasing each other, trying getting into fights...But since then, it’s died down a lot,” said Oshita. Hauge knows that things didn’t just get better. New rules and staffing adjustments had to be implemented in order to make a difference. 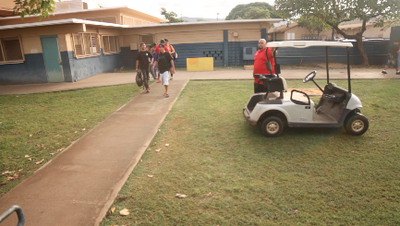 This year, the administration has made great efforts to improve the Waianae High School increased the amount of security guards on campus, implemented a locked gate procedure, a new attendance policy, and alternative learning programs that help keep repeat offenders out of the general classroom. “I can tell you I’ve lived here since like 1956. And the threat of violence is way lower than it used to be,” Hauge said. 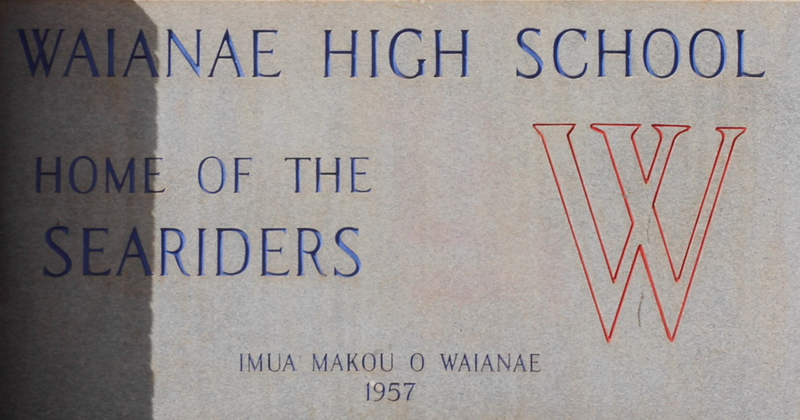 Although Waianae’s image isn’t immaculate, they are doing their best to improve it. 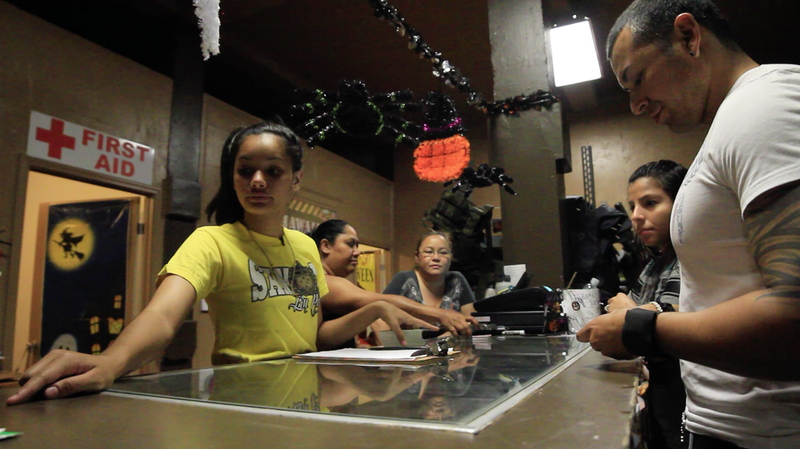 They want to make school as safe as possible so students can focus on graduating and following their dreams. 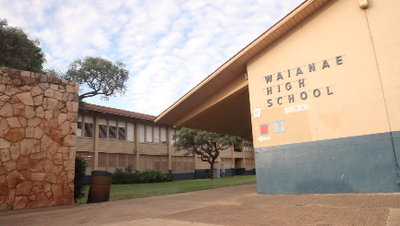 ﻿"It's pretty amazing how much the violence in Waianae High School has decreased." Everyone goes through their own unique set of obstacles, and for most teenagers, heartbreak is at the top of the list. Senior Kahea Lagasca is no stranger to the romantic undertow. 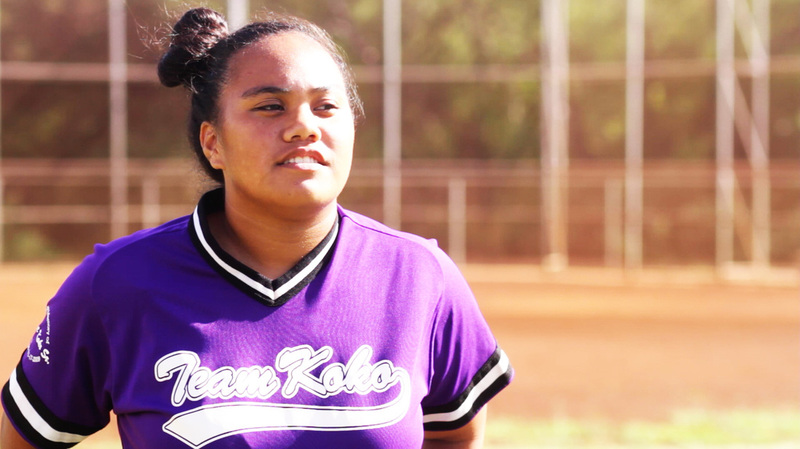 Kahea’s life was looking up, she had a boyfriend, a sport she loved, and supportive friends. For Kahea, her relationship was her rock. However, her rock was swept out to sea, and Kahea found herself paddling back to shore, alone . 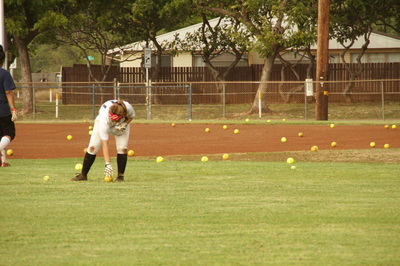 But even through rough waters, her love for her relationship was not greater than her love for the sport and her team. 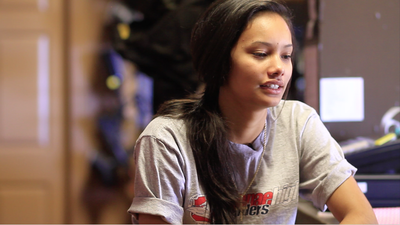 With this attitude, Kahea has not only won the hearts of her teammates, but their trust and respect. As team captain of the Wai’anae High School varsity paddling team, Kahea supports her team, because she can’t afford to leave another man behind. From that moment forward, paddling kept her grounded and helped her to stay in place. It became the new found passion that kept her anchored. 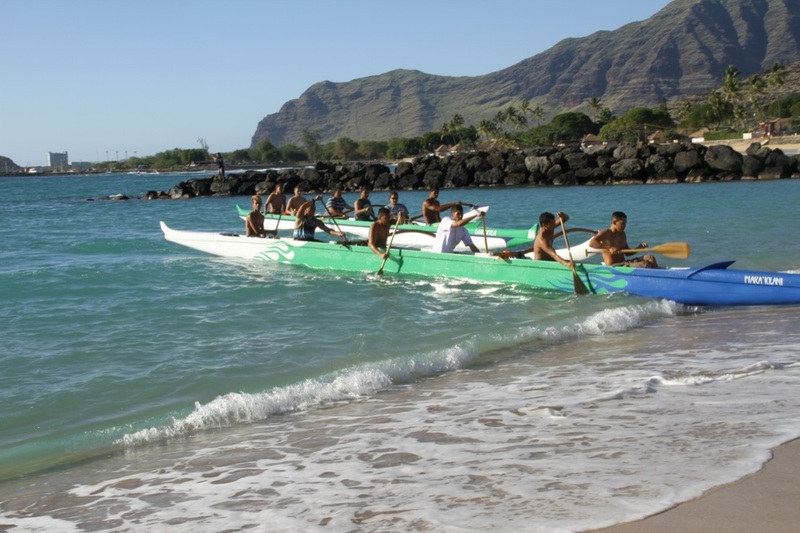 Kahea has found that with paddling, she can stay focused through the highs and lows. “I just took the frustrations out in the boat. 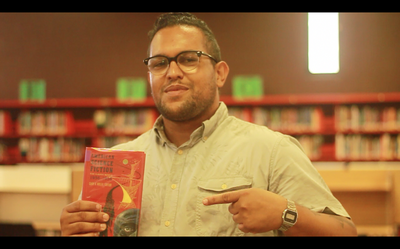 It helped me to get through the struggles of my frustration in school, and in relationships”. 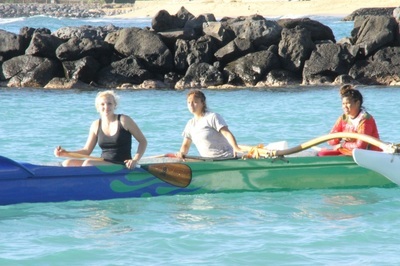 With paddling, Kahea has learned that even if she gave it her all, it wouldn’t be enough without a team to support her. 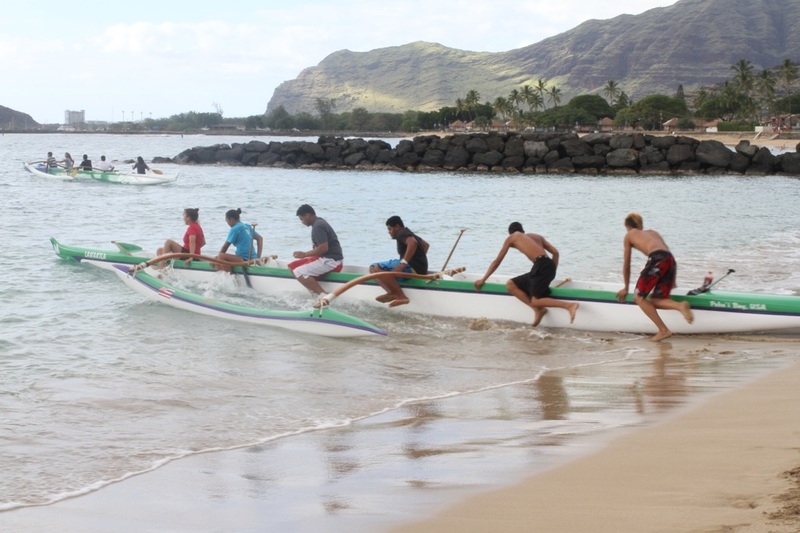 Paddling became such a huge part of Kahea’s life that she left her lifetime love, “I dropped hula for paddling,” and with paddle in hand, and her team by her side, Kahea rowed her way to the top. “We’re a team and we’re always going to be together and no matter what we do, even if we fail, we fail as a team or we strive as a team”. 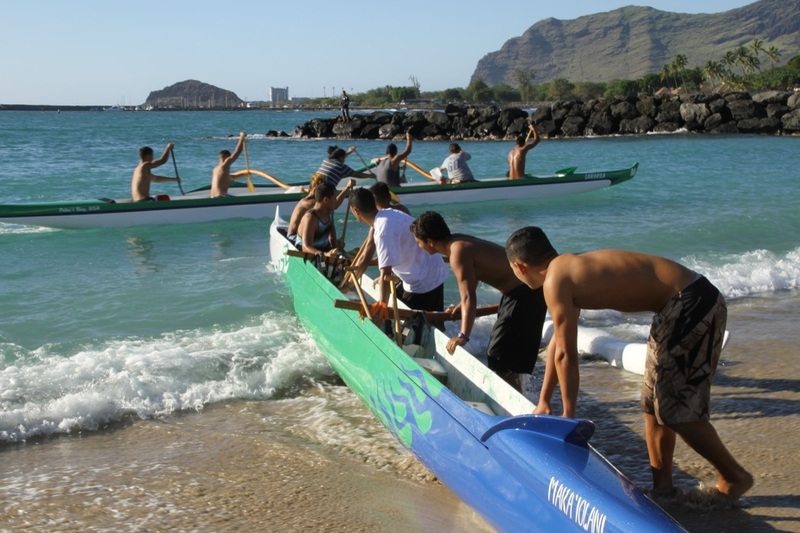 Last year, Kahea and her team won first place in the OIA state-wide paddling championship. 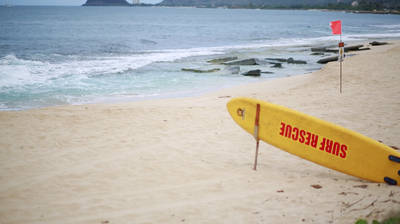 With a new-found taste for glory, Kahea isn’t quite ready to lay down her paddle. “It was kind of like an inspiration for me and thats kind of my goal is to like try to win or get to championships”. 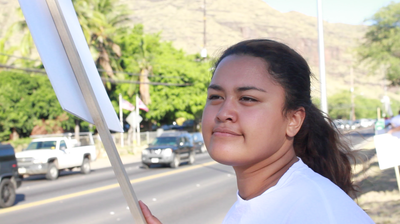 With this attitude, Kahea is steering her way to victory. ﻿I've realized that it is better to see the big picture than it is to be alone and not want to be a part of something incredible. ﻿Looking back, it's easier to work as a team than it is being alone. Every teenager has something bigger that they aspire towards: a school they want to go to, a person they want to be, or a career they want to have. However, not all of them take action towards their goals. According to Quartz, an online news magazine, only 30% of people end up working in the profession they dreamed of since they were kids. As teenagers grow and change, so do their goals. “I love science,” said junior Donald Keopuhiwa, “but as time progresses my mind tends to change because I do new things and makes me think what else I want to do. 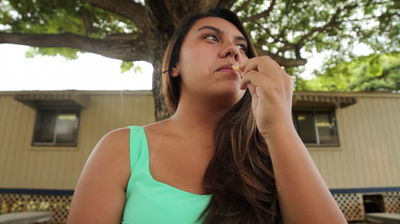 Waianae High School senior, Sharina Lagrimas, is the complete opposite. “I’m really clear on what I wanna do in life and I have been planning this since I was 7th grade,” she said. From the start, Sharina had a clear idea of what she wanted to do - become a pediatric nurse. What makes her different, is the fact that she decided to try make her dreams a reality. 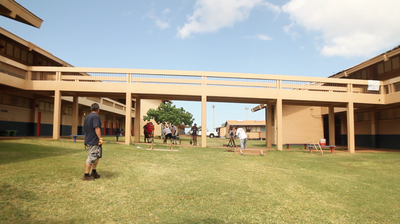 Waianae High School offers six different academic pathways where students can take classes that are specific to their future major. 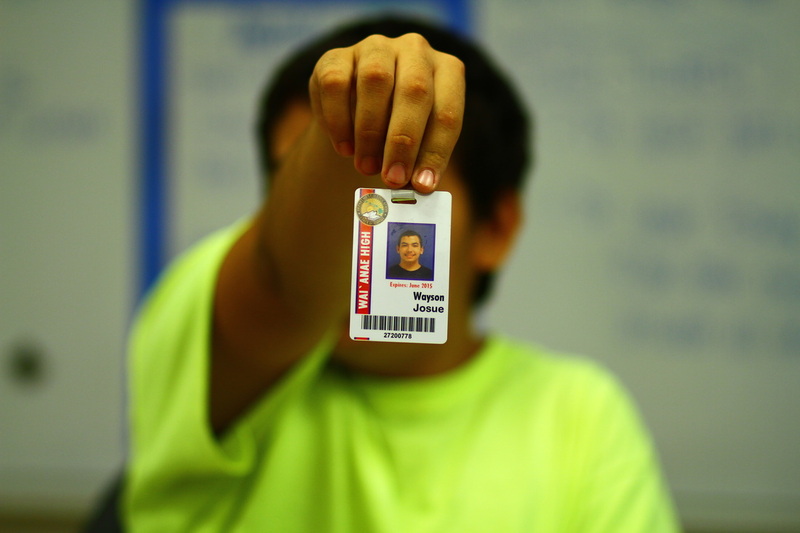 Approximately 150 students are enrolled in the Health and Human Services academy. 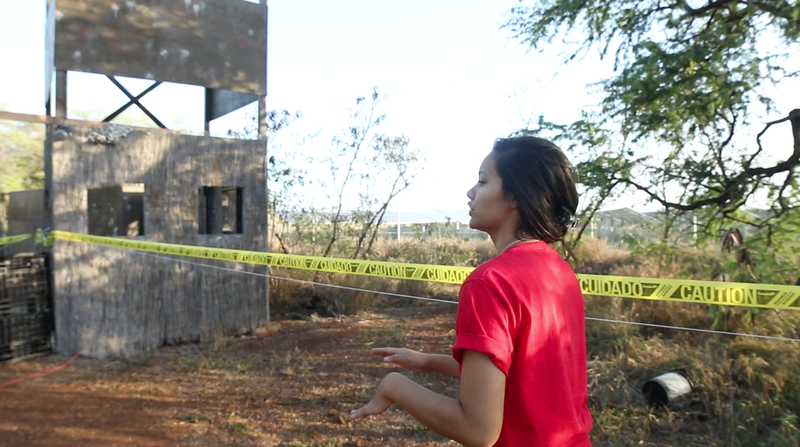 New additions to the program include an internship at the Tripler Army Medical Center and a simulation center at the high school. The simulation center has nurses come to the high school every Thursday to do demonstrations and simulate a real hospital environment with the students. 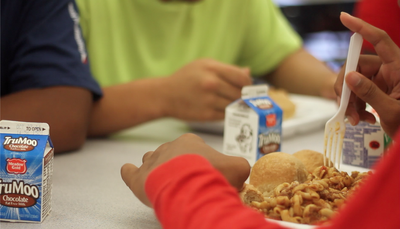 Allowing the students to experience these situations give them real insight into their future. However, regardless of how many opportunities and programs there are, only one thing can turn a dream into a reality: motivation. Some young adults go with the flow, and others take the initiative to create their own future. Sharina’s advanced involvement with her field is only furthering her progress towards her goal. Having the Health and Human Services academy is a big help, allowing her to take a step not only towards, but into her future. However, when it all comes down to it, her secret to being driven for success is having goals set in stone. ﻿"Seeing students working in the simulation center made me want to start taking action towards what I want to do in the future. I definitely see the advantages." ﻿"I see a lot of open opportunities to the simulation center and I wish there were more programs that helped students pursue the career they want." Every hero has the moment they need to be ready for, that one moment in every dangerous situation when disaster strikes, when they are called upon to react at a moments notice. 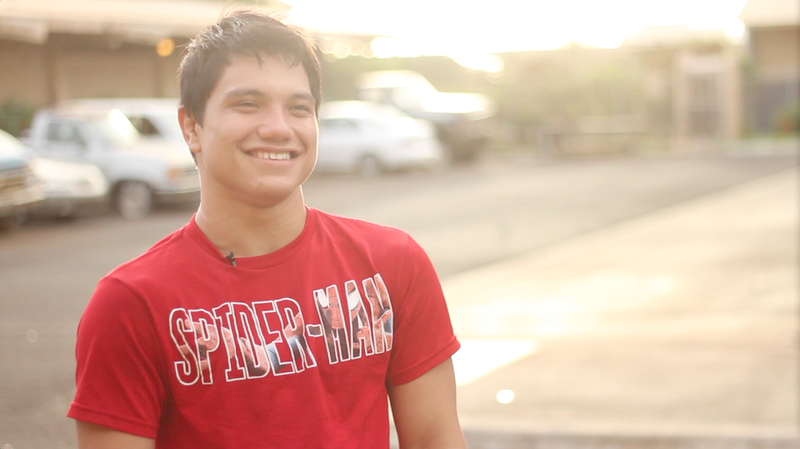 For Rayden Keaulana, that moment is what he lives for. 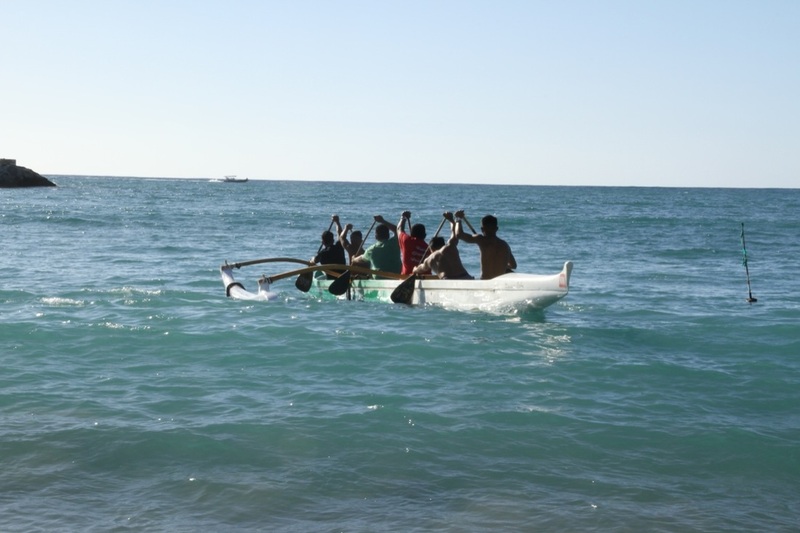 “You see a guy is drowning, you’ve got maybe 30 seconds to get the guy before he goes underwater, you have to make sure you get from Point A to Point B and back on land in a matter of seconds,” he said. 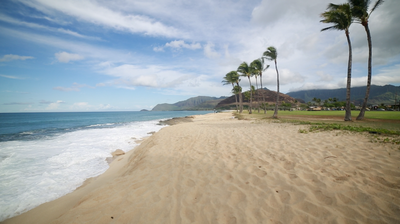 Staying prepared may be a bit more difficult when your office is the stunning Makaha Beach. Even on his days off, Lifeguard Rayden Keaulana is always on duty, from shore to shore, with water comes responsibility. 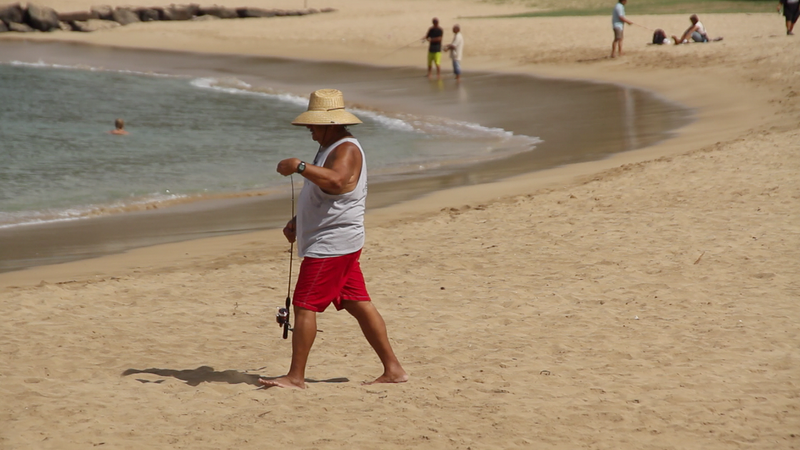 Rayden inherited this responsibility from world-renowned surfer Buffalo Keaulana, who just happens to be his grandfather, and the original lifeguard of Makaha Beach. “Whenever someone’s in trouble, and you’re a lifeguard, no matter where you’re at, you’re on duty,” Buffalo affirms. Even so, the Keaulana’s are steadfast in the fight to increase Hawai’i’s Lifeguarding Staff. “Jr. 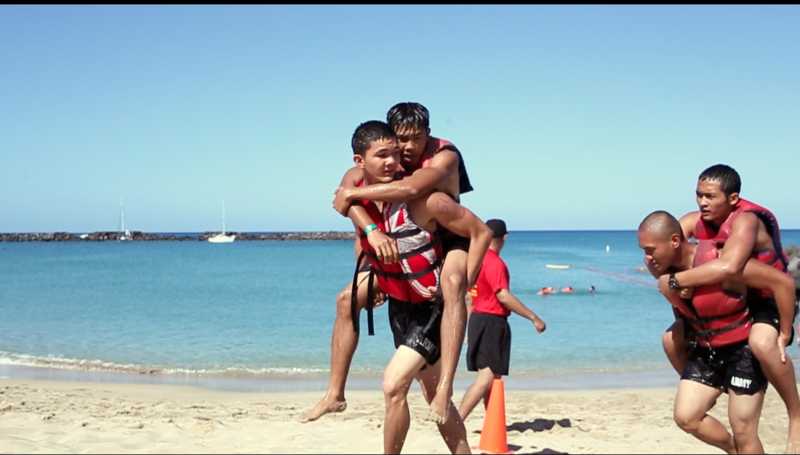 Lifeguards is a program that teaches kids basic skills, swimming skills, how to get out of certain situations and CPR,” explains Rayden. 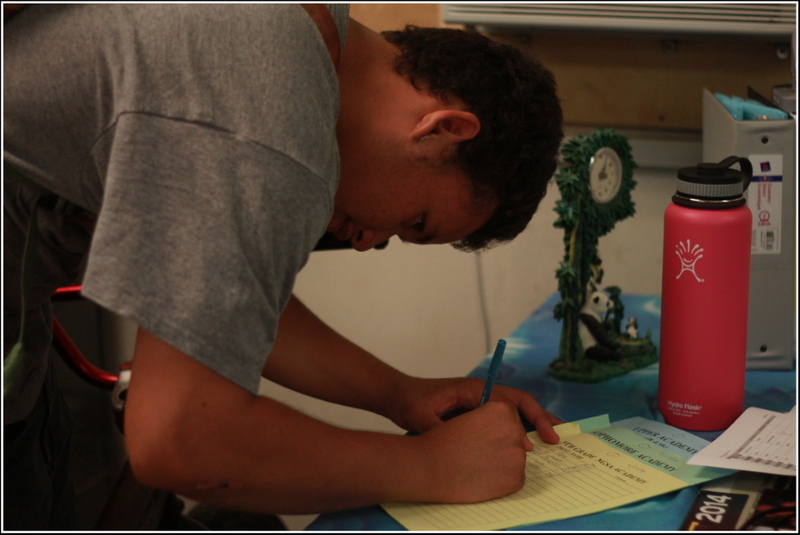 One pupil of his can attest to the benefits of the program, “It helped me develop as a person. 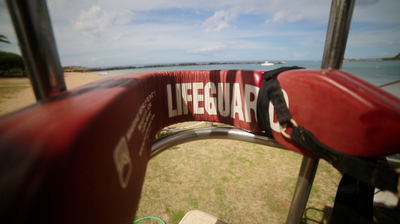 It makes you realize people should be mindful of others, you know a lot of things can happen out at sea,” mentioned Jr. Lifeguard Jeremiah Gionson. It is a mindset like the Keaulana’s that may be able to keep programs like the Jr. Lifeguards afloat. 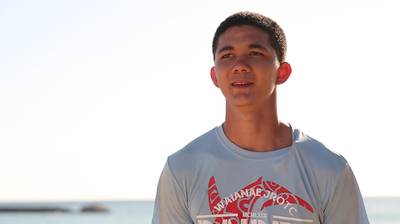 Programs that help to build strong young leaders with the potential for heroism, “If one of the students was here, and they saw someone drowning out there, they could easily yell to the lifeguards or do something you know, we teach them certain signs,” explains Rayden. Unfortunately, only two sites are under current operation. 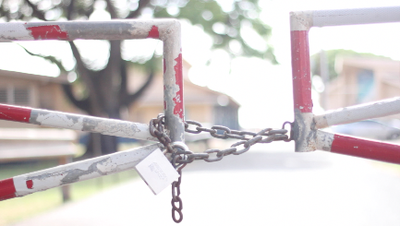 Due to lack of funding, these sites are slowly drowning in a sea of red tape. In this moment, just like a lifeguard, Rayden dove in headfirst to help. Unfortunately, this year he was too late to save the Jr. Lifeguards, but that still hasn’t stopped Rayden from helping kids in need. “They’re the heroes? Maybe, yeah. Some of them actually wanna be guards when they’re older.” That would be the perfect end to another day at the office for Rayden, and he wouldn’t have it any other way. 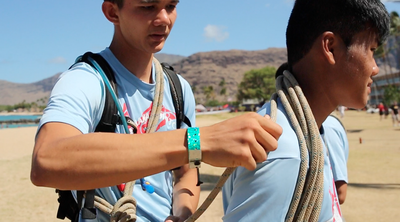 ﻿"It was awesome to know, how willing someone is to risk their lives for others." 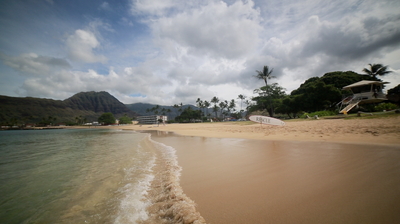 ﻿"It never crossed my mind how many unguarded beaches there are in Hawai'i and the effect it has on our state ." ﻿"It was great to see that someone is fighting to keep the lifeguard programs alive." 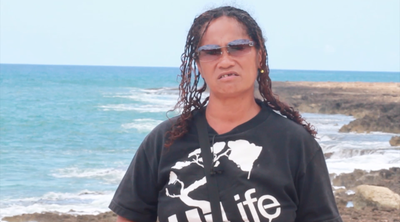 ﻿"I never knew how many people in Hawaii died from drowning." Monday through Thursday for senior Harmonie Westbrook, a multi sport student athlete at Wai'anae High School, is a continuous cycle of involvement. 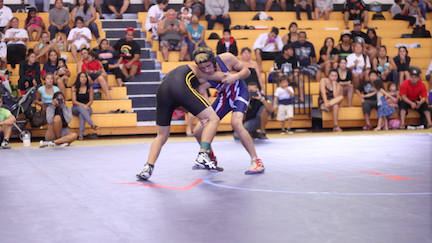 "Wake up, go to school, right after school I lift with the wrestlers, walk straight to the Wai'anae Boxing Club, train until about six thirty and then go home, shower, eat, do homework; work on projects if I need to, college apps, and then go to bed." said Harmonie. For Harmonie, doing what she does isn't just an option- it's a lifestyle. "I feel like if you don't give your 110% in what you do, then you're doing the wrong thing." added Harmonie. Harmonie always puts that little extra in extraordinary- however, last year, she found herself wrestling with a very serious problem. "I left during practice and I came home crying to my mom saying that I hate wrestling and that I didn't want to do it again. I just felt so exhausted...so I didn't get no sleep and I just felt so overwhelmed and stressed out with everything." said Harmonie. Ultra competitive students such as Harmonie face extreme levels of physical and mental stress. By putting so much emphasis on doing her being in everything she does and not taking any breaks, Harmonie has become part of the student athlete population that is faced with a battle with themselves. According to a University of Toronto study. 40 percent of teenagers who participate in school sports suffer from high levels of stress and feelings of depression. "I mean I seen her dehydrated. I seen her so thin. I was saying, 'Harmonie quit.' I could just see her mentally, physically and her body was just deteriorating." said her mother, JoAnn Westbrook. Maria Thompson, a Psychology teacher at Wai'anae High School says that it's very normal for teens with Harmonie's time sensitive and taxing physical and emotional demands. "Physiologically their hormones are still blasting away- going up and down. so conflicts like that can happen and would create a biological reaction." said Thompson. This type of reaction is best dealt with an outlet, she added. In many cases, student athletes turn to their parents, a trusted adult, or best friend. Harmonie, on the other hand, took a more physical approach to coping with her stress. "Paintball is my favorite sport because it's such a big stress reliever besides the fact that you get to shoot people and it's legal." said Harmonie. Harmonie's parents own the Hawaii Extreme Paintball and Airsoft field, and on Saturdays and Sundays from nine to five, Harmonie is afforded the opportunity to be around every weekend, working the register, reefing paintball games, or dealing with the customers who want to play games. 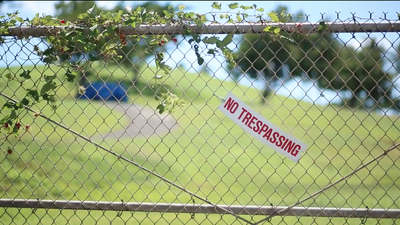 Whenever life seems tough, she's able to go to the paintball field and alleviate whatever it weighing on her mind. "Paintball helps me a lot especially stress wise. Every time I feel overwhelmed of I just feel irritated or annoyed I just ask my dad to watch the office, pick up the gun, and go in a couple games to relieve some stress." said Harmonie. 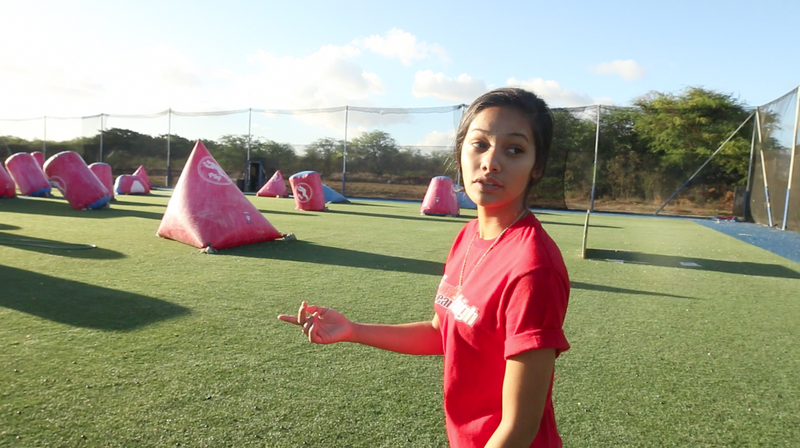 "This paintball field is my home field advantage because it's my paintball field." Tap outs, jabs, and some fully automatic firearm carnage is the inharmonious hectic life that some how all fits in to complete Harmonie. "I play paintball, so was a cool sport to cover." ﻿﻿"It was a fresh take on home field advantage." ﻿"Being a student athlete is time consuming." Everyday, about 2,300 people are reported missing in the United States. 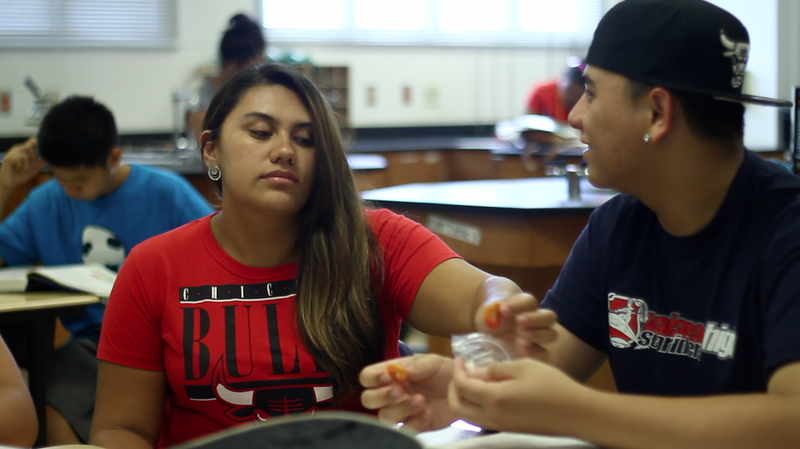 Here at Waianae High School, many students are unaware of a simple piece of plastic that may just save their lives. 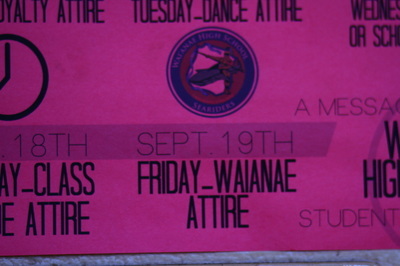 Waianae High School’s push for this material to be worn, may be cramping some student's style, but if it’s not worn more often, student's sense of personal fashion may disappear completely. Waianae is thinking about enforcing a uniform policy if I.D.s are not more visible on campus. To teens, fashion at school may be the biggest form of personal expression. “Well I feel like uniforms will cut off our ability to express ourselves," explained Senior Wayson Josue. Although students care about saving their free dress from uniforms, they are blinded by their looks and sightless to the meaning that I.D.’s are not made to cramp your style. I.D.s are not just for safety, student are able to check out books from the library, as well as purchase school lunch that can help with their nutrition and concentration by silencing their grumbling tummies. “There are some other useful things that go along with having an I.D... another one is that you can go into the school library, you could check out a book. All they need to do is just, look if you are the person whose picture is on the I.D. its useful if you decide to eat lunch if theres money in your account or if you're free and certified they just scan your I.D. 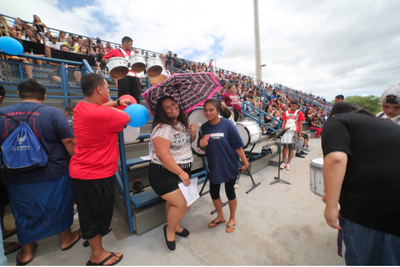 check to make sure you are the person in the picture and you get your lunch money.” said Ms. Weidman, a counselor at Waianae High School. However, in addition to these beneficial purposes, your life could actually be saved by this little piece of plastic. “Most important purpose of students wearing their I.D.s is for safety, students with valid I.D.S we know for a fact that they belong on campus and since we have a very open campus theres many places where, people can just come in and leave campus I think its really really important to have a way of identifying who really belongs here and who doesn’t.” explained Mr. Kurose, vice principal of Waianae High School. Day and night, people are roaming around campus. 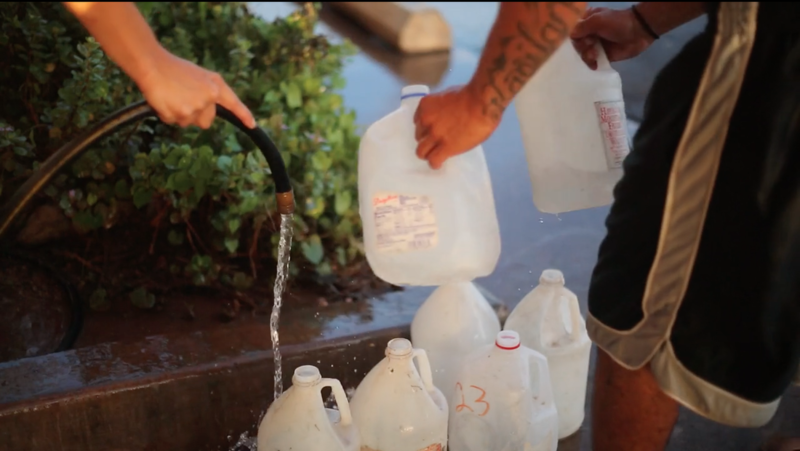 Located next to a homeless encampment, anyone could actually pay a surprise visit. “We have parents sometimes who want to come on campus just to see if their kids are in class or not.” Weidman added. 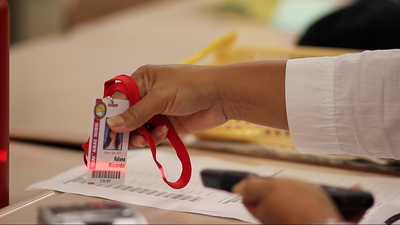 School staff enforce what the rules are and they use the I.D.’s to identify if that person belongs to this school. Administrators are discussing a new resolution to this issue of insubordination, one that may just put students back in uniforms. 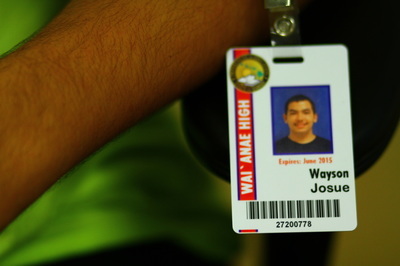 Students like senior Wayson Josue are not happy about this. “I think it would block school spirit.” he explained. These fashion killing uniforms could end the life of a free dress school. However, there is a simple way to divert this fashion disaster. 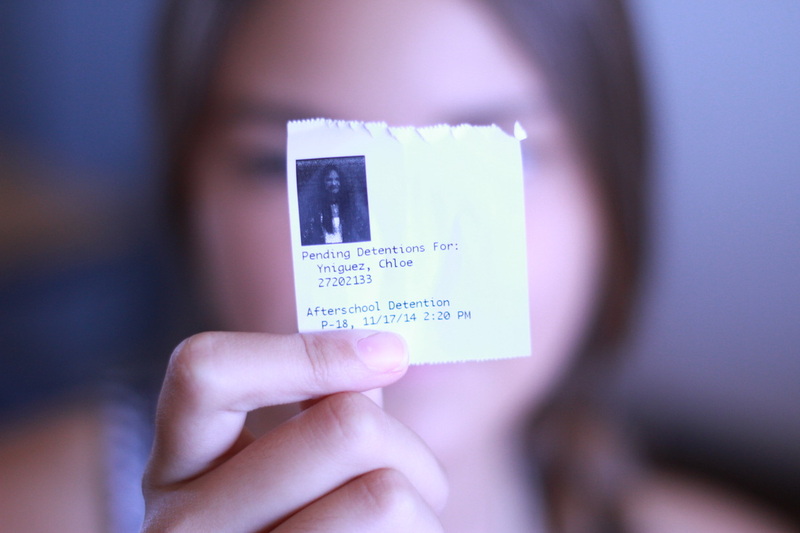 “It’s better safe, than sorry” explained sophomore Gabbrielle Galano. 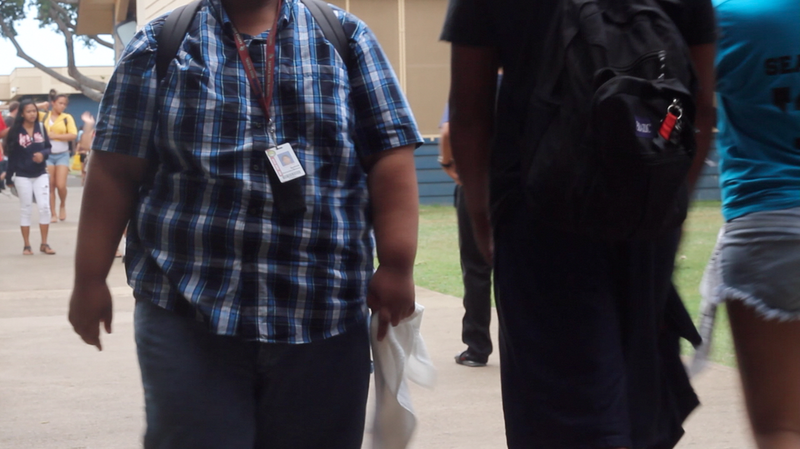 One student leads this fashion trend to safety, wearing his I.D. every day without fail. 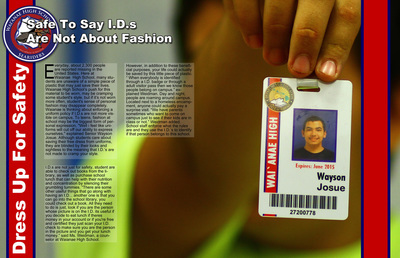 “Its easy to wear an I.D.” says Josue. This schools free dress may be ended. No official say, but the best way to avoid this fashion disaster is to wear your I.D.s, it's better late than never, but never late is better. 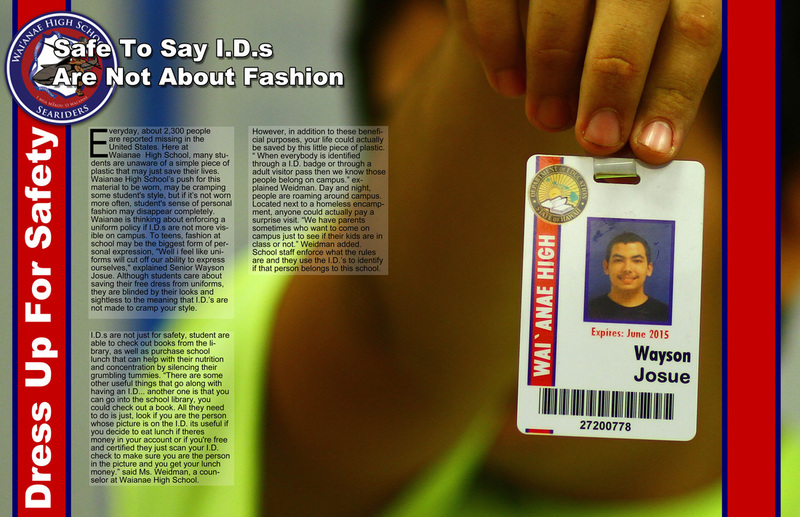 "It's just a picture, it doesn't show who you really are," Wayson Josue said. ﻿"At first I had no idea what I.D's were for, but now I understand the truth behind that little piece of plastic." ﻿"I thought they weren't that big of a deal for anyone." The Hawaiian culture may still seem foreign to some, but for Keala Molina-Wilcox, it represents all that is home. Growing up, Keala was immersed in Native Hawaiian traditions. 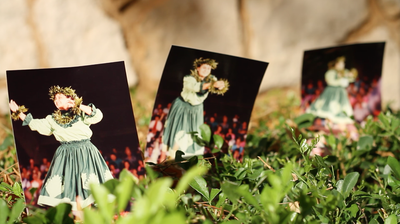 She knew the stories, ate the food, and even swayed into dancing hula. “My sister and I danced hula. 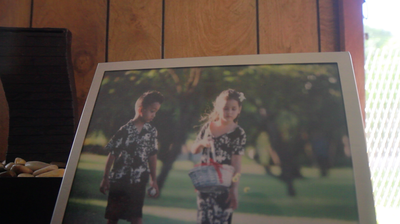 Besides hula, my grandma spoke Hawaiian, so I grew up hearing the language," Keala said. This foundation of the Hawaiian culture turned into a thirst for more knowledge. She took four years of Hawaiian Language in high school, when all she needed was one. 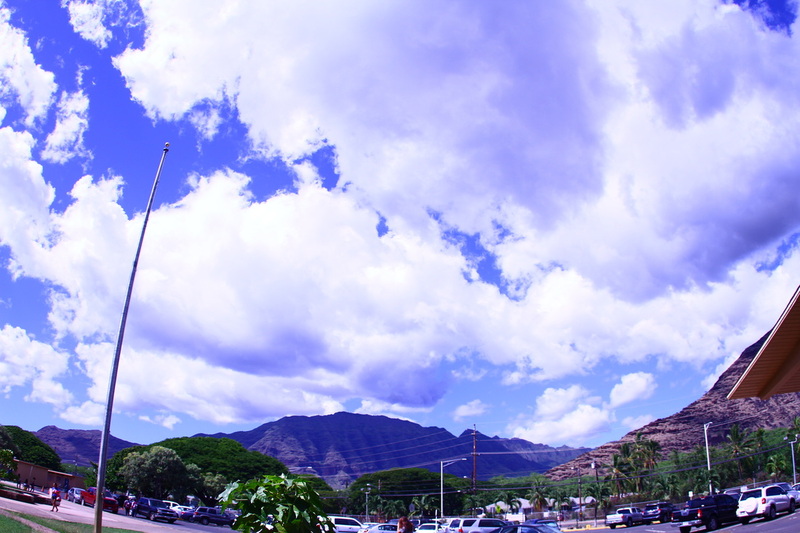 She then ended up majoring in Hawaiian language at the University of Hawaii at Manoa. “It was the main culture in my life, but I knew that the language part was what I was missing, so as I grew up and I moved on to college thats what I kinda immersed myself in,” she expressed. 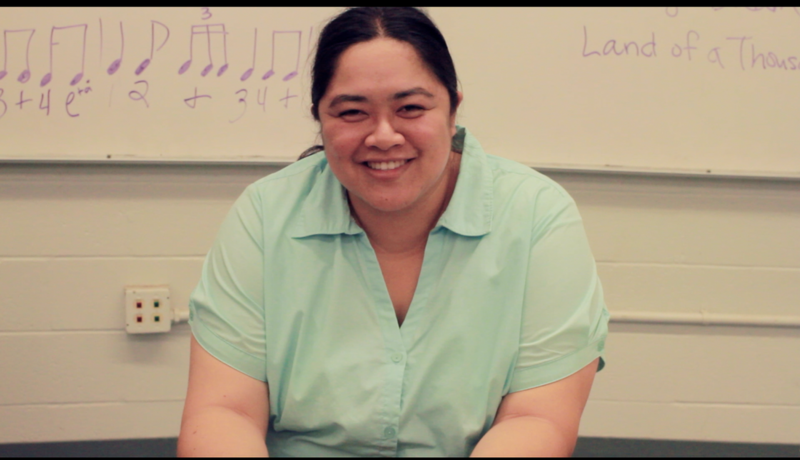 Keala’s academic interest transformed into a career when she accepted a job at Waianae High School teaching Hawaiiana as Kumu K. She confessed, “I benefit from the culture one way or another. I feel a responsibility to be able to teach the younger generation a little bit about their culture and language.” Its here, where she believes the students will be apt to embrace their culture. To-Hawaii.com reveals that statewide, only 0.1% of people who live in Hawaii speak the native tongue. The death of the language is a growing possibility unless something can be done to prevent it. One thing that contributes to the truth of this statistic is the misunderstanding that colleges don’t accept Hawaiian as a language. 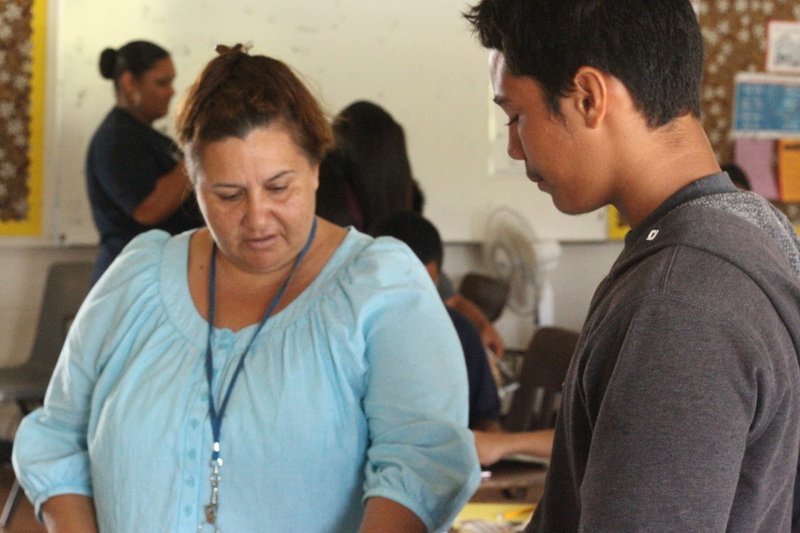 Waianae High School college and career counselor, Theresa Sanchez, sheds some light on the situation. “When you are looking at colleges that you need to apply for, you need to look at what the admission requirements are. 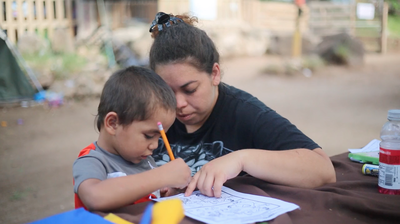 [Hawaiian language] wasn't accepted before, but now its accepted in most colleges across the United States, and if you do come across a college where it is not accepted, you can always appeal a request for your credit to be accepted,” Sanchez said. That’s where Keala dances her way in. “Being Hawaiian, of course it's important because that's who we are. It's a blueprint to how we behave, how we think and how we act. Culture identifies who you are. It makes you separate from other people. Being that hawaii is so, we have so many ethnicities that live here. I think its important for our Hawaiian culture to know and understand who they really are." 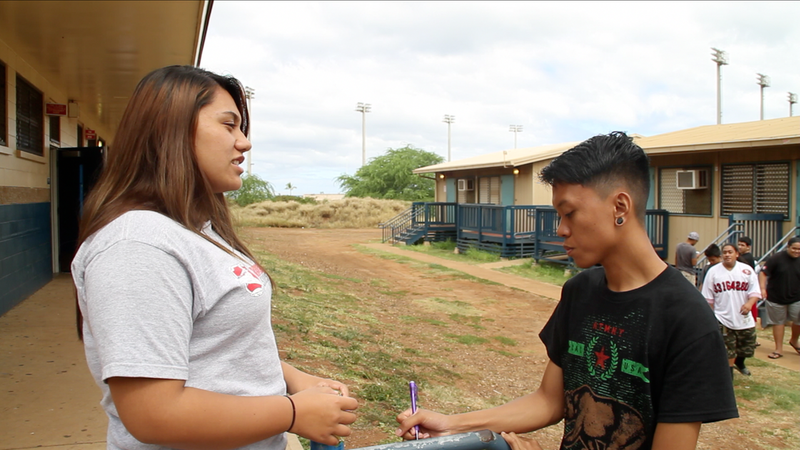 Keala feels the need to pass that idea of cultural identity on to her students. 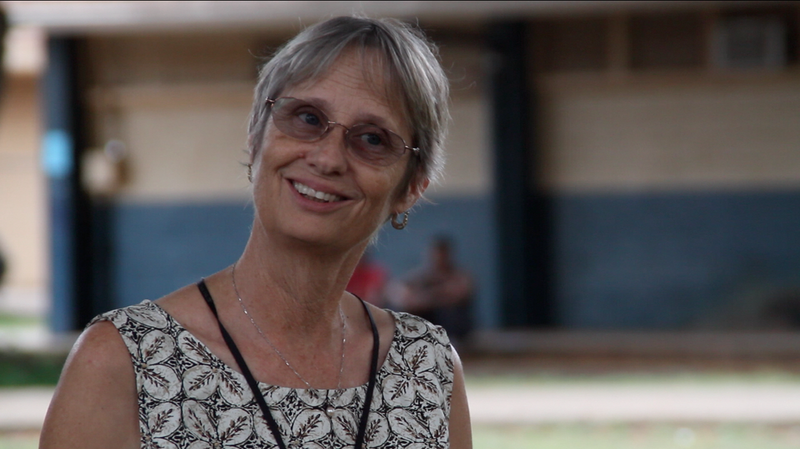 She teaches them not to see the Hawaiian culture as separate from the modern world, but a meaningful link to a rich and beautiful past. "I think it's important for our Hawaiian culture to know and understand who they really are," Keala Molina-Wilcox said. 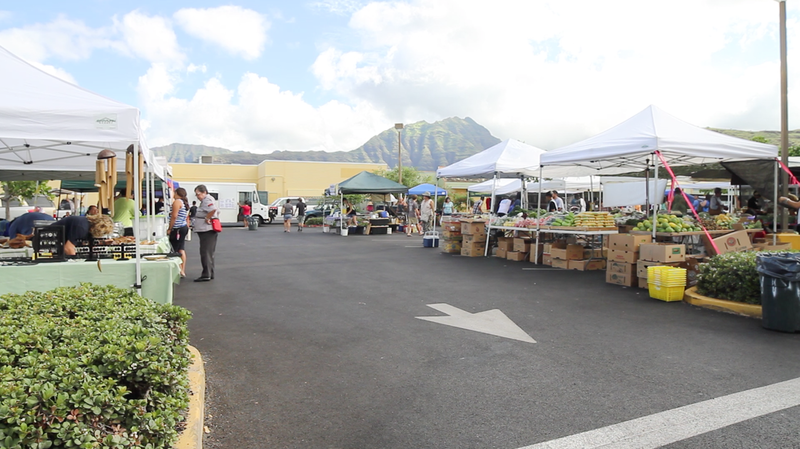 ﻿"It was interesting to see how invested people are in the Hawaiian culture." 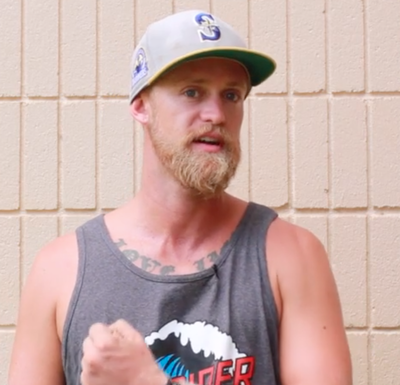 ﻿"It's touching to see people that passionate about their culture." 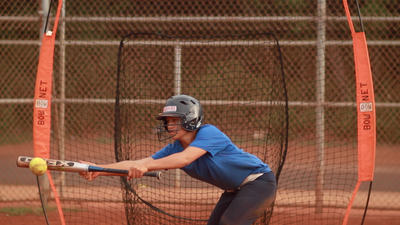 This summer, 18 year old Abreen Padeken has got a lot on her plate. For starters, she sells garlic fries every Saturday with her family at the Waianae Farmer’s Market. 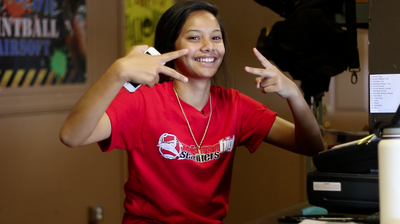 On top of that, a large portion of her time is spent as Student Body President at Waianae High School. 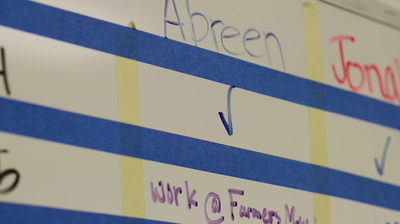 To add the icing on the cake, Abreen is occupying the rest of her time and efforts to helping a local candidate. “My family has been involved in sign waving and pep rallies and we will be doing phone banking and then going from door to door trying to get one on one person interaction.” Abreen said. At around the age of six, Abreen was exposed to politics and the importance thereof. 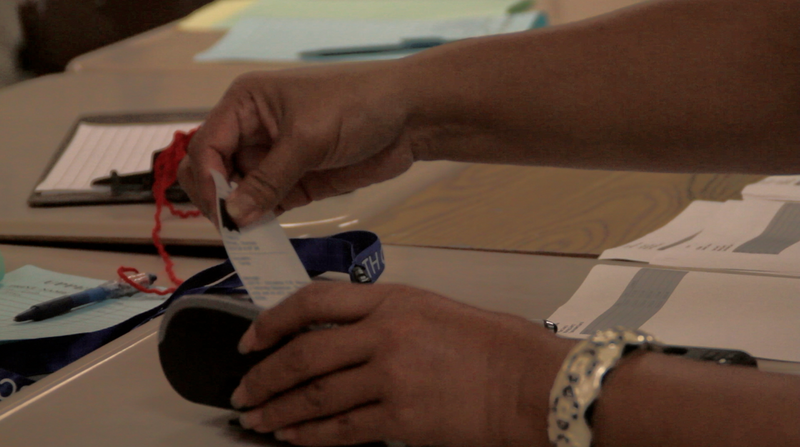 Her father, Daniel Padeken Jr., is a passionate advocate for teen involvement in the voting system. “See, if there’s a big push in the high schools leading up to the 18 and 19 year olds about voting and the importance of voting and making a difference in your community...people would find it important so when they come 18 years old they look at it like, ‘Wow, I finally can vote!’” he said. According to The Center for Information and Research on Civic Learning and Engagement fact sheet, less than one third in the islands between the ages of 18 and 29 voted in the last Presidential election. This was by far the worst youth turnout in the country. “People should know who’s going to be in the government, who’s going to be working for what they value, who’s going to be fighting for them.” Abreen said. 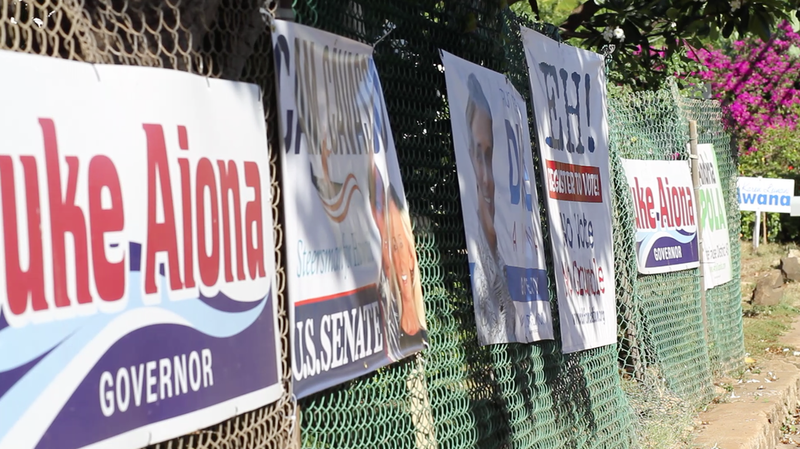 Organizations like We Vote Hawaii, are contributing to drive the fight towards civic education. “The public schools do not have a program of civic education...if you really understood that who you and what you voted for made a difference in your daily life now, not in the future, I think more people would vote,” said the We Vote Hawaii founder Lyla Berg. This program helps the students by educating and registering them at 16 instead of 18. The hope is to prepare them for the democratic process. 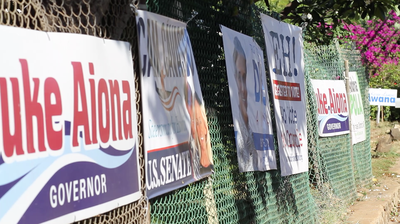 “I believe our young people are the leaders of today not just in the future and if you could make your voices really heard through the voting process...I think adults are going to pay attention and we certainly can learn a lot from you.” said Lyla Berg. 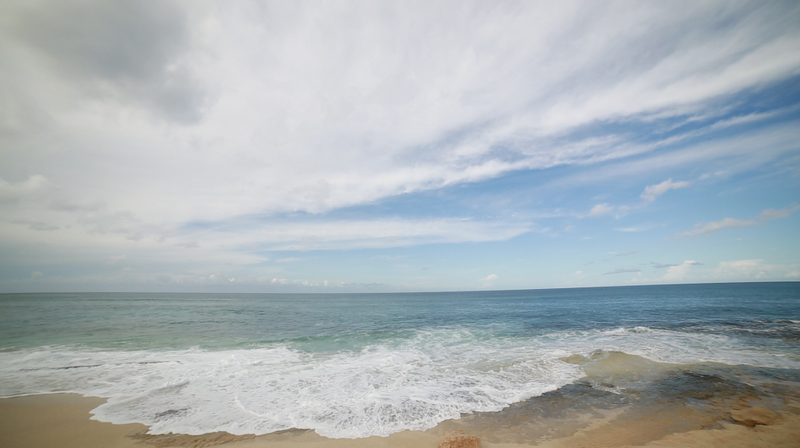 A lot needs to be done to turn the page on a new chapter in Hawaii. Between assisting her parents at the Farmer’s Market, helping out a candidate, and working on her responsibilities as Student Government President, Abreen knows there’s still tasks that need to be worked on at Wai’anae High. As the Student Body President, she would like to talk to the students and various clubs, resolving their concerns. “I care. I care about everything that’s going on,” Abreen said. 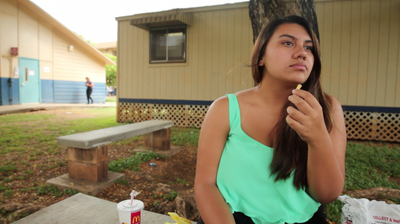 For Wai’anae High School Senior Mylea Saga-Moore, making her favorite afternoon snack is not as simple as it used to be. 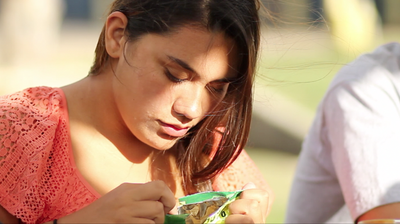 She sits among her peers, each with their food of choice - fast food, lunchables, and school lunch. Unfortunately, Mylea doesn’t have much freedom when it comes to food. She’s not alone in the in her struggle, though - approximately one in four teens are fighting the battle of diabetes every day. 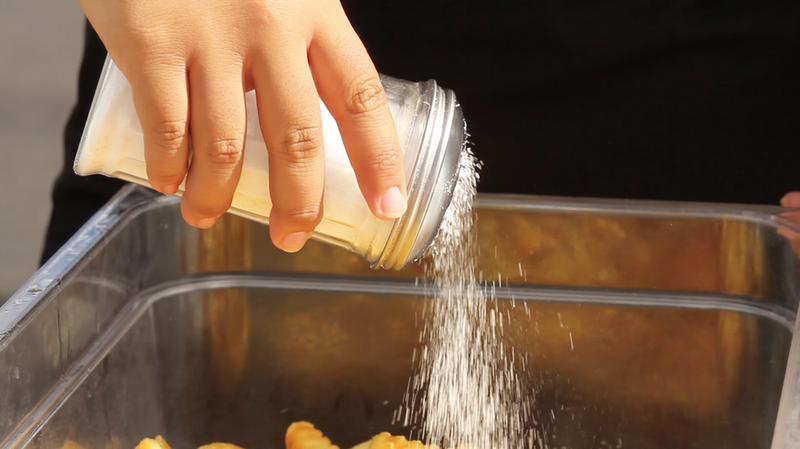 Approximately twenty thousand teenagers in the United States are diagnosed with type 2 diabetes. 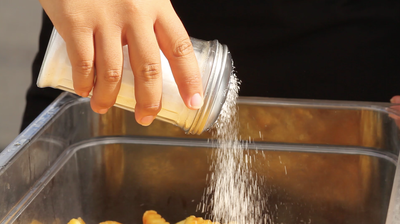 Type 2 diabetes is primarily caused by poor eating habits. For many teenagers, such as Mylea Saga-Moore, it was easy to get carried away with the junk food. 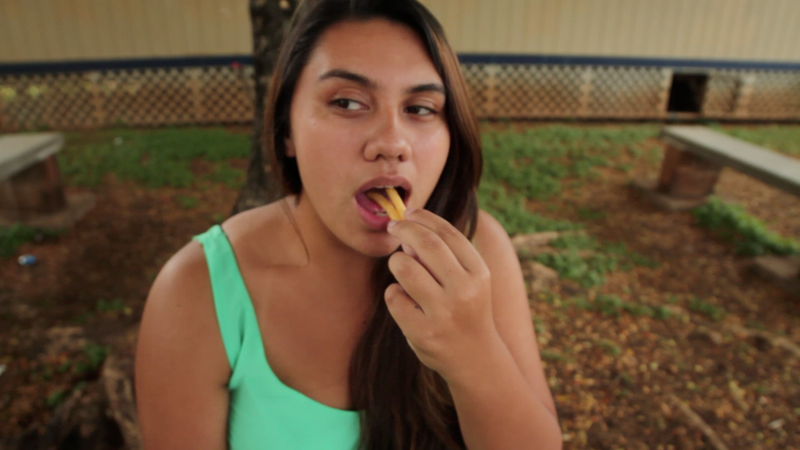 “I LOVE to eat fast food. That was, it’s a weakness. I think everybody needs a little handholding on the way up and I think sometimes the adolescents don’t get enough of somebody that really cares enough about them,” she said. 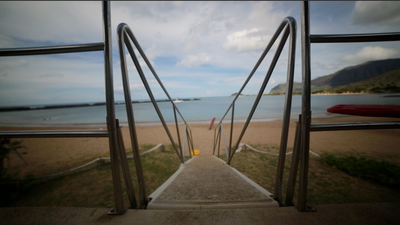 Fortunately, there is a solution in Wai’anae. 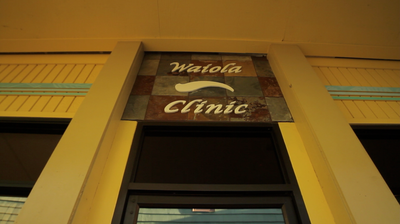 Waiola Clinic, a medical office designed specifically for teens, is going to become available. Visitors are kept confidential, and students can seek guidance, therapy, education, and general wellness at the clinic. The teen clinic is expected to open before the end of the year, offering services beyond health care, such as computer access, counseling, and an overall safe environment for teens to hang out. It’s easy to access and available during all days of the week. “Not all teens have a strong network of people that they feel comfortable talking to and if they had a place they could go to where they felt that they were respected and that their views were going to be kept private, they would maybe be more willing to seek the care that they need. That they deserve,” says Vija Seghal, director of pediatrics at the Waianae Coast Comprehensive Health Center. 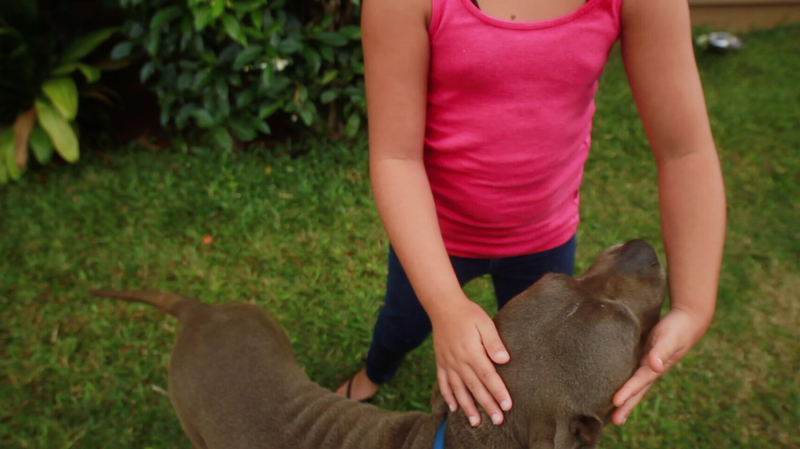 Until then, Mylea will rely on the support of her peers to help her manage the disease one blood test at a time. 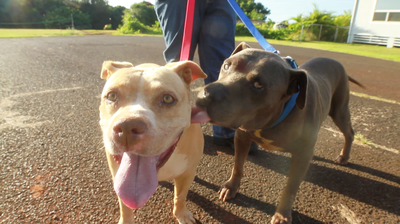 Paana [Sunshine, in Hawaiian] and Koua [Rain, in Hawaiian] are two old dogs whose puppy love has grown into a mature relationship. Ever since they were born they’ve been inseparable. 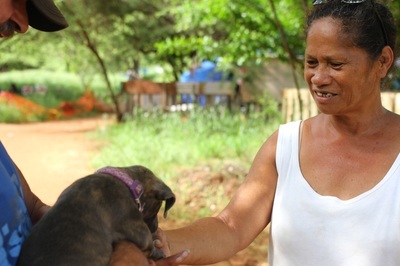 Though they don’t have any children of their own, their owner, Esther Rivera, has been an addition to their family since she was 17 years old. With the passing seasons of life, came memories and joy. “They fight over whose friend is walking by because they don’t bark at other dogs, they bark at each other,” Esther Rivera said. As family members, they not only raised Esther but also her nine year old daughter, Jaysie-Jean, as well. For Jaysie-Jean, they are just like another set of parents who spend quality time with her and show their dedication through love. While they can never have a verbal conversation together, they constantly show an interpersonal relationship when communicating. “Ai! Where that maka-pia-pia come from?” Jaysie-Jean said, wiping Koua’s eyes. From ups and downs and experiences that shake the core of the foundation in a family, this past year, the Rivera’s spotted a storm that was coming for Sunshine and Rain. 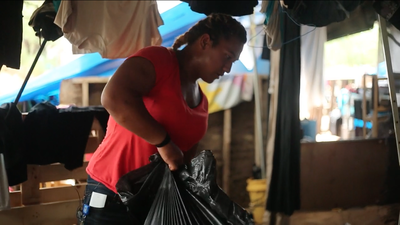 Though the actual storm wasn’t similar to the slow and deadly force of a tsunami, underneath the surface, held a gust of wind that took the family’s breath away. “We weren’t really sure what it was. Then we took him to the doctor and they said that it would possibly be cancer. And then I noticed a couple of months later that she had a few blister spots.” said Esther Rivera. Unfortunately, Paana and Koua were both diagnosed with different forms of cancer. As head of the household, this left Esther with a very difficult decision to make. 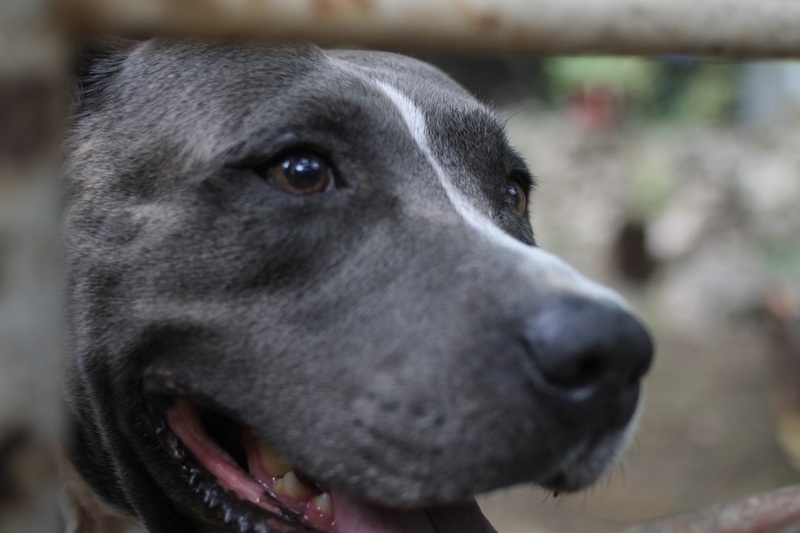 “To put down or not...I just don’t want them to suffer,” Esther said. 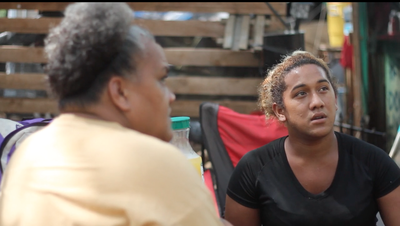 However, because of everything they’ve been through, not everyone was on the same page when it came to the well-being of Paana and Koua. “We’re not putting them asleep,” Jaysie-Jean said. Several surgeries and a few months later the cancer is currently in remission. However, the family is still weathering the storm. “It was a learning experience and it was, you know, very emotional,” Esther said. 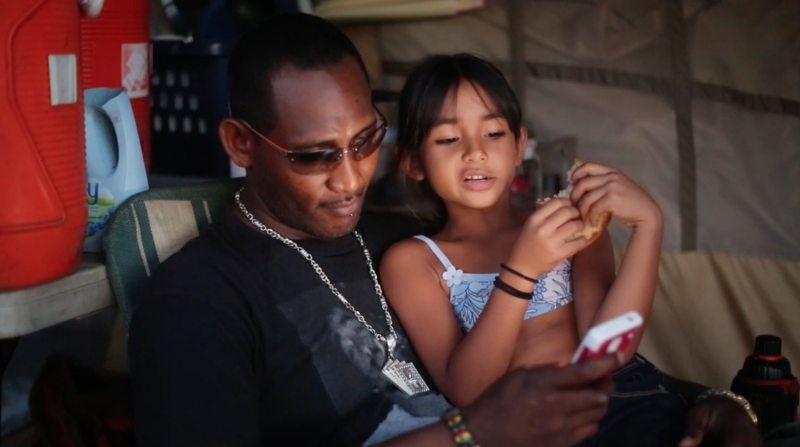 “They’re like the most important thing of almost everything except my parents,” Jaysie-Jean said. On the road from remission, they know it’s not going to be stroll in the park. For now, this couple is going to enjoy whatever time they have left. “Just...crossing our fingers that it doesn’t come back,” Esther Rivera said. Even if it does return, this family will stick together come rain and shine.